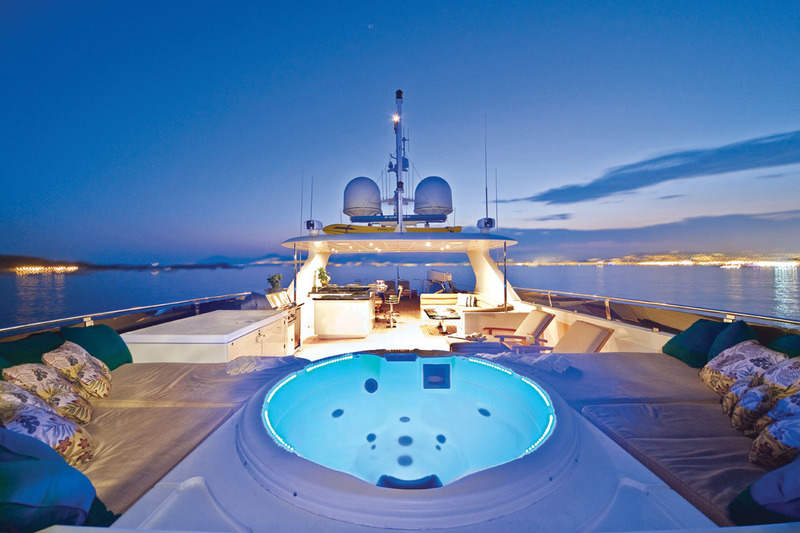 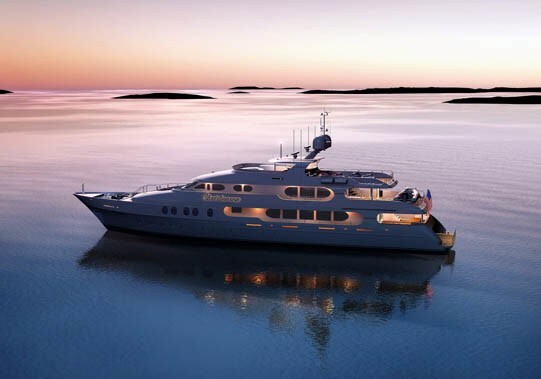 Luxury motor yacht One More Toy is a fine example of a boat with classic beauty, exquisite style, and impeccable taste. 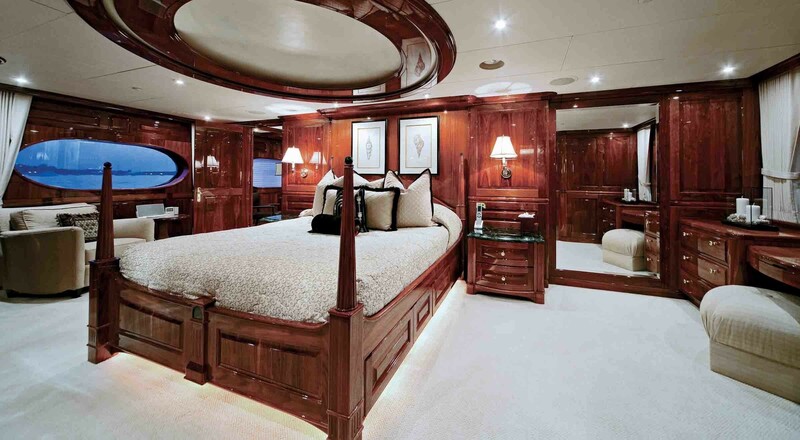 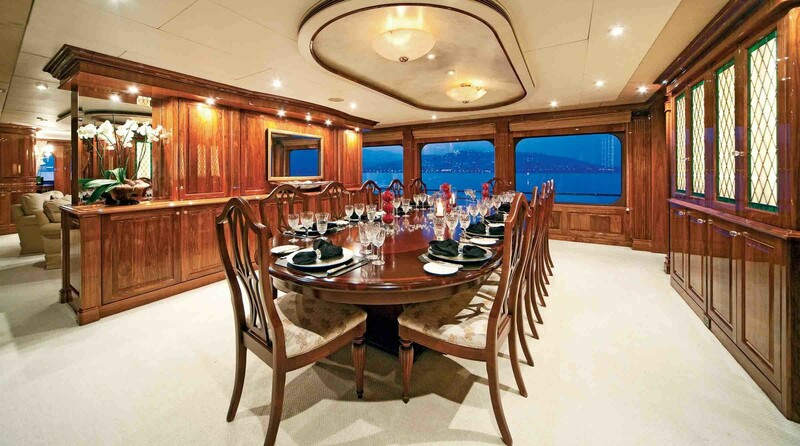 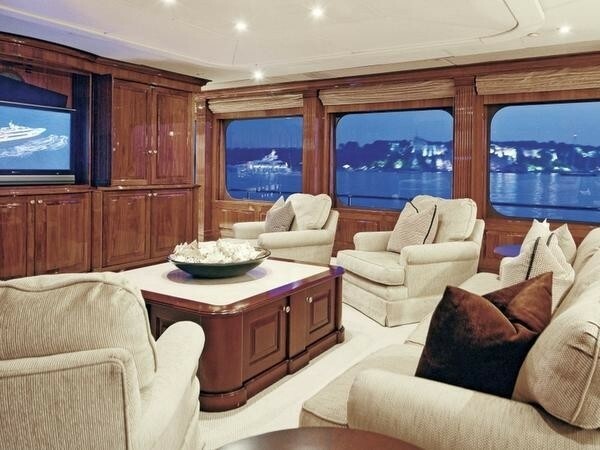 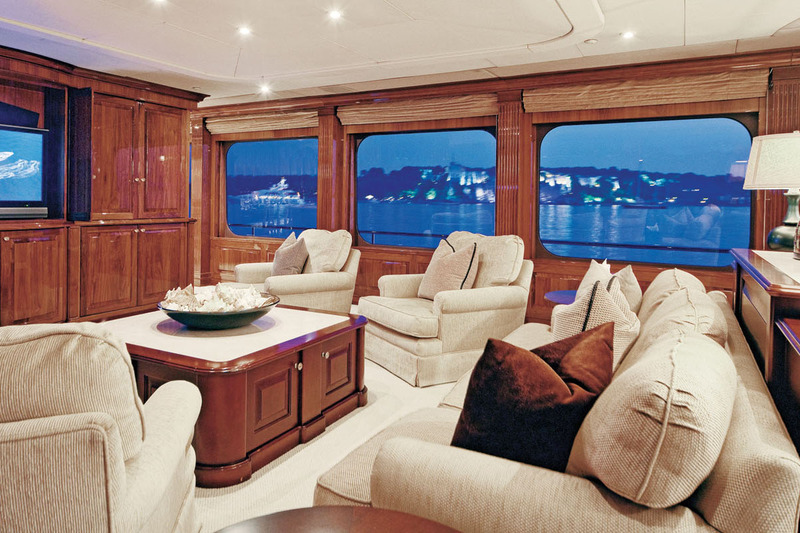 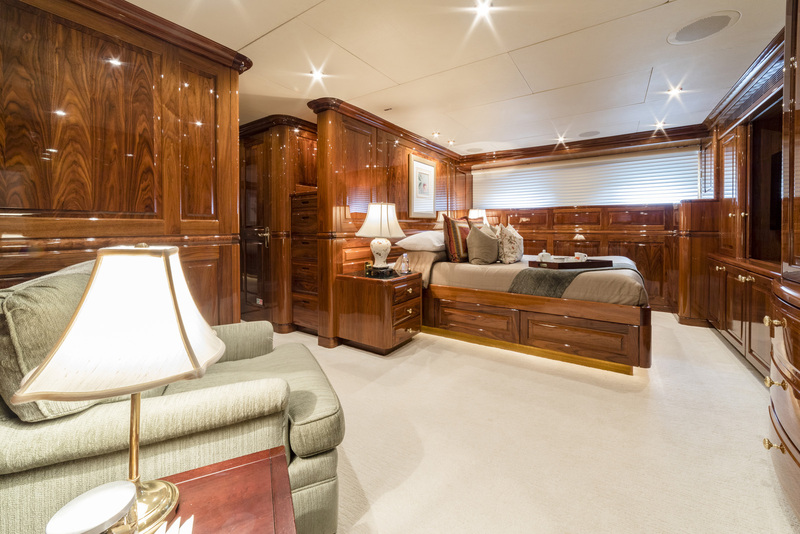 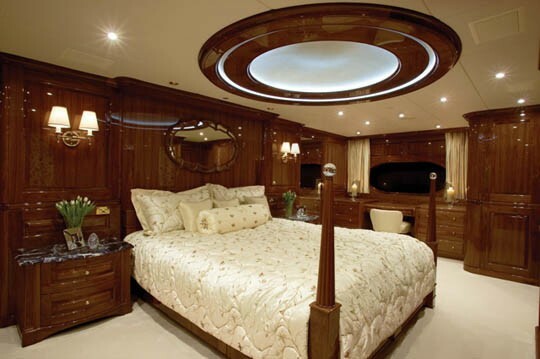 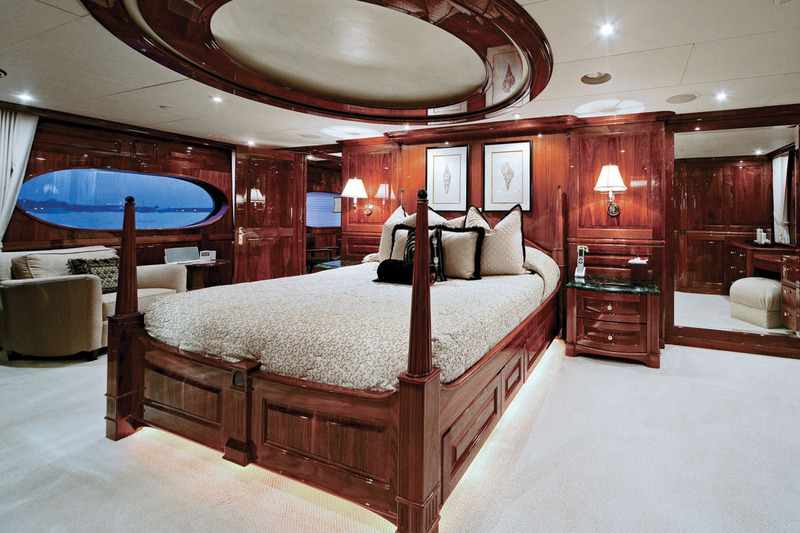 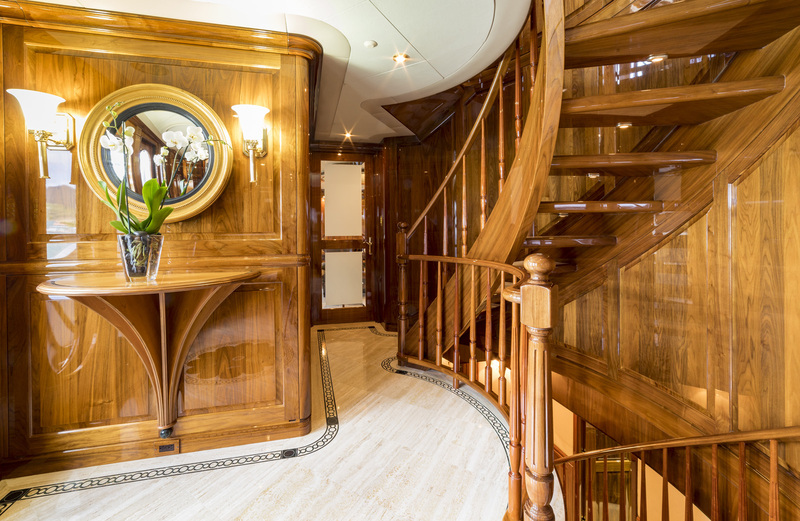 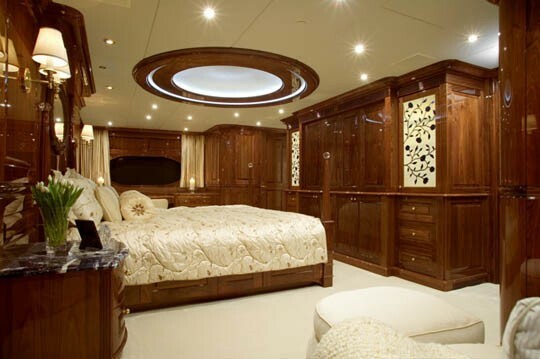 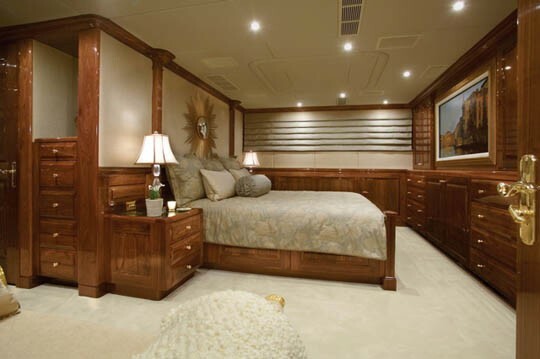 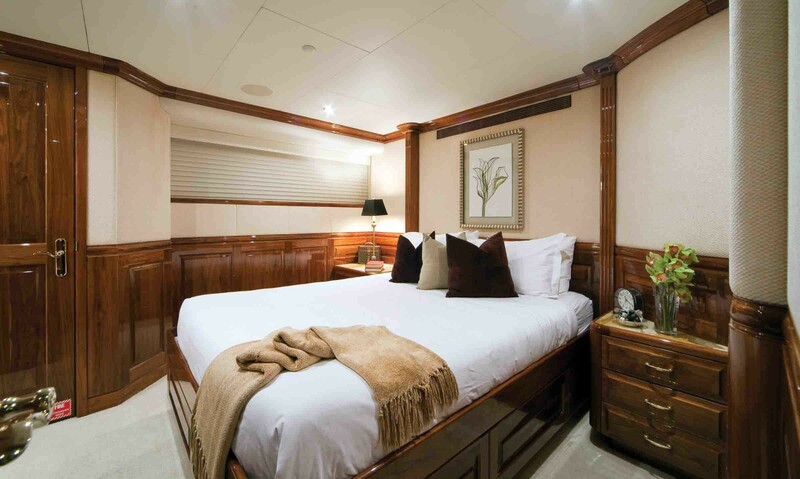 She is decorated in fine fabrics with black walnut throughout and offers accommodation for 12 guests in 6 cabins. 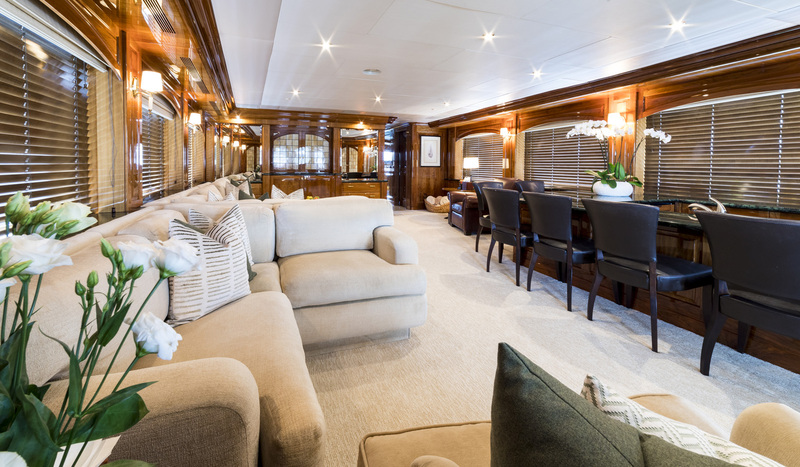 She is fully equipped with a range of excellent entertainment systems and areas, ideal for keeping your entire party entertained. 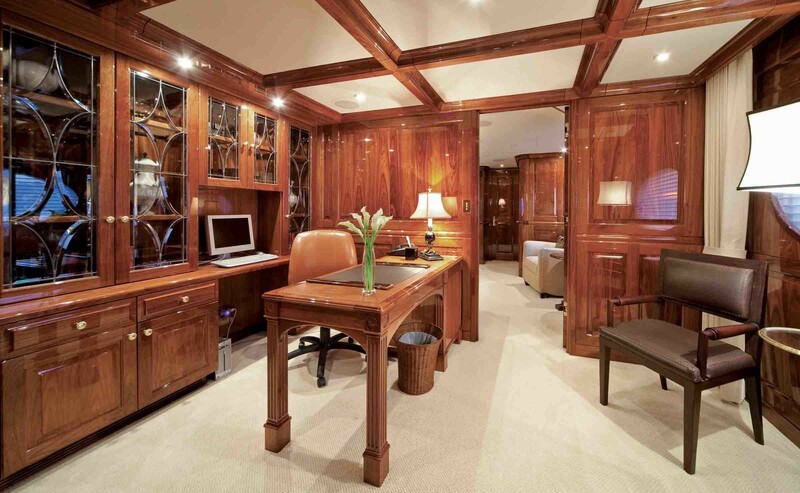 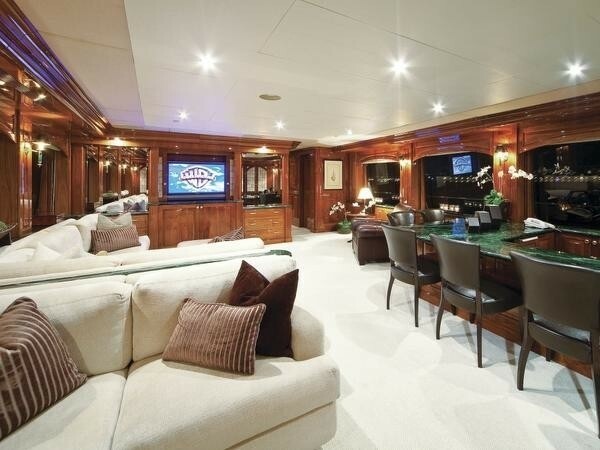 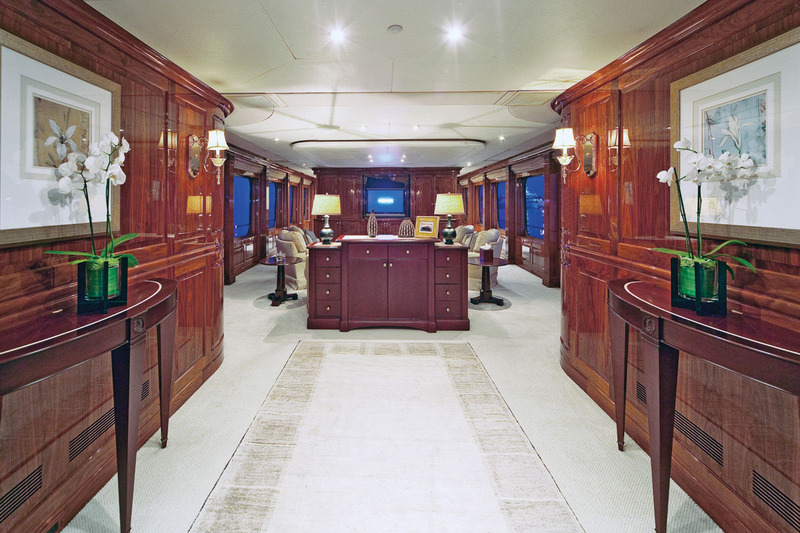 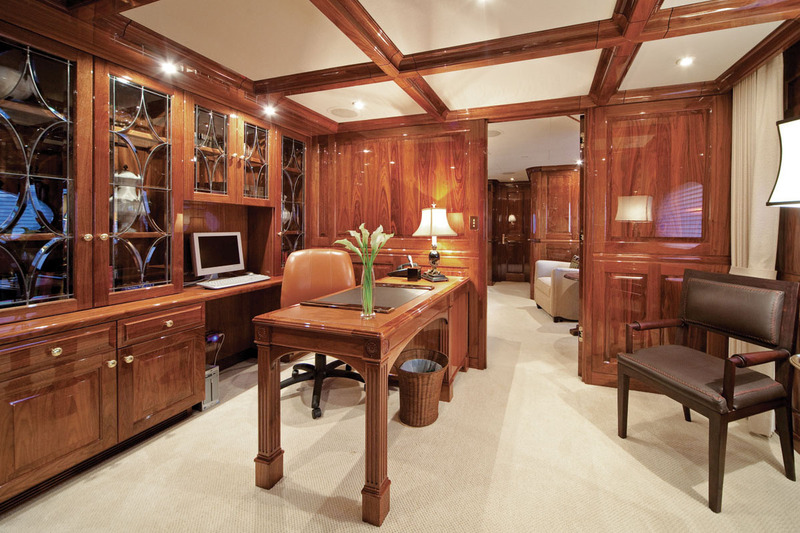 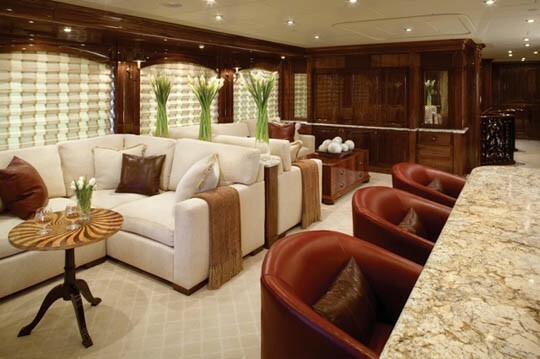 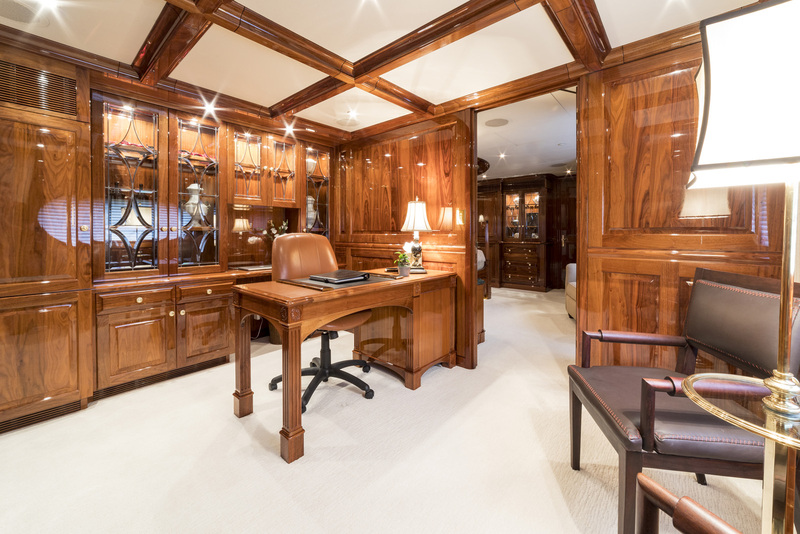 The main salon is fresh and comfortable with an entrance lobby fwd of mid-ships and a day head for general guest use. 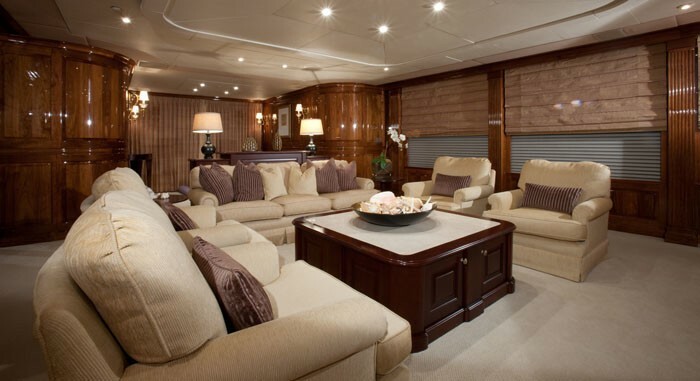 The main salon has a comfortable sofa, low table & 4 upholstered swiveling armchairs. 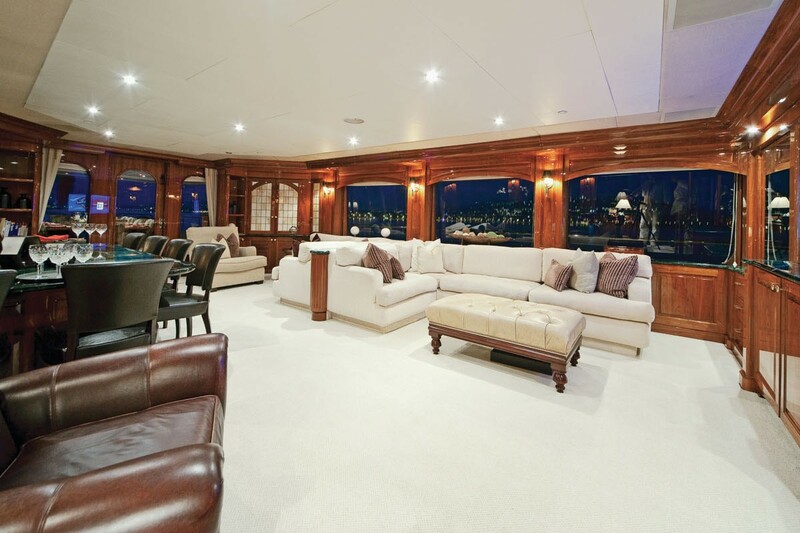 Large panoramic windows illuminate the salon & provide great views. 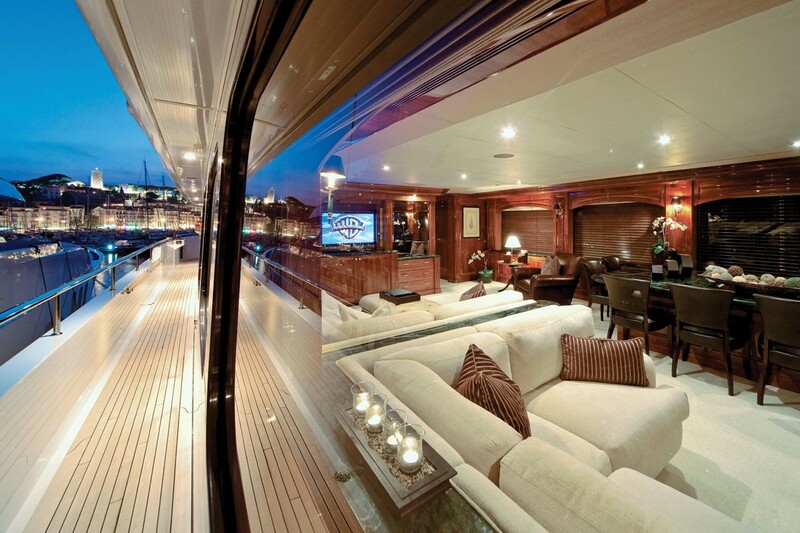 All windows are fitted with privacy & sun shades for guests convenience. 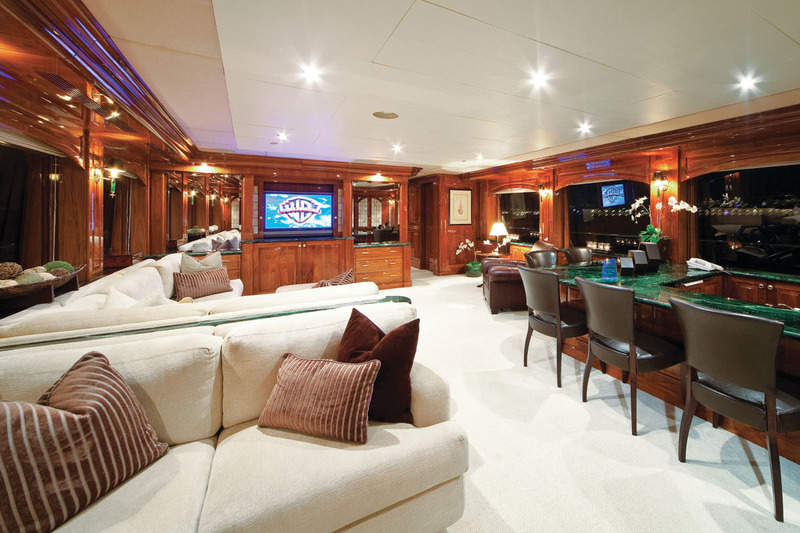 The main salon is equipped with a complete entertainment center including a 42” plasma TV DVD/CD, VCR tuner and DirecTV satellite. 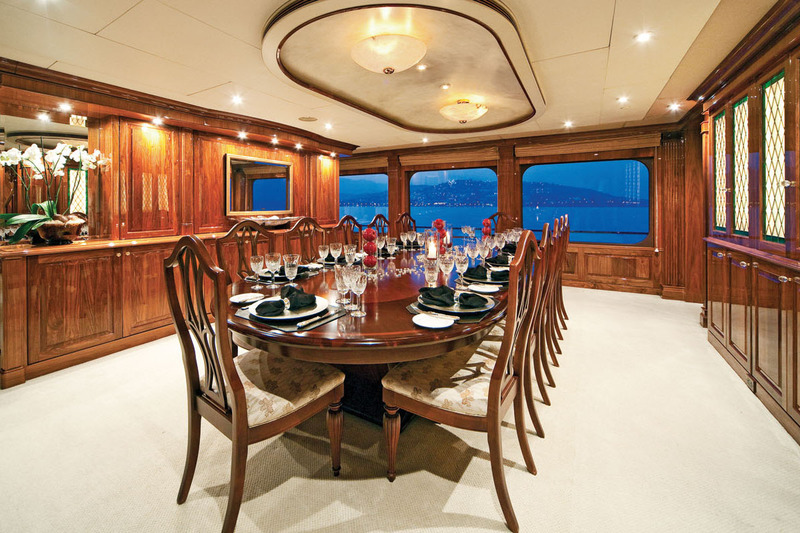 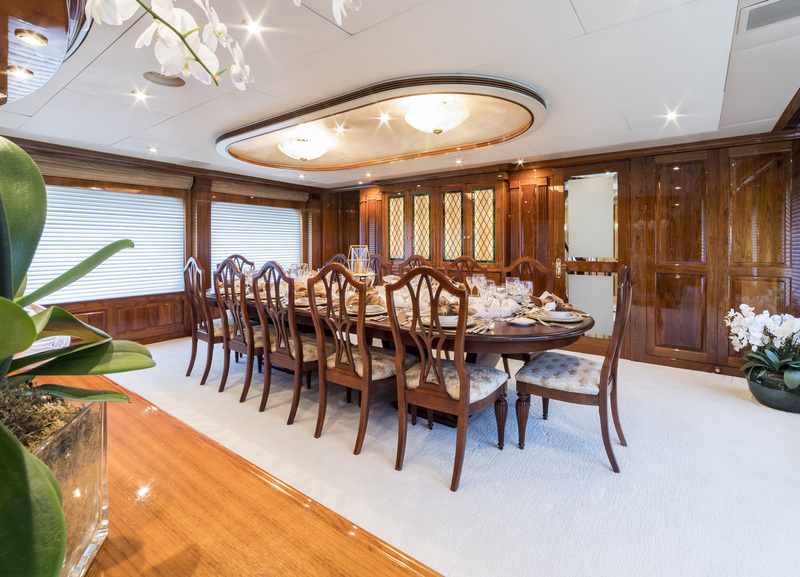 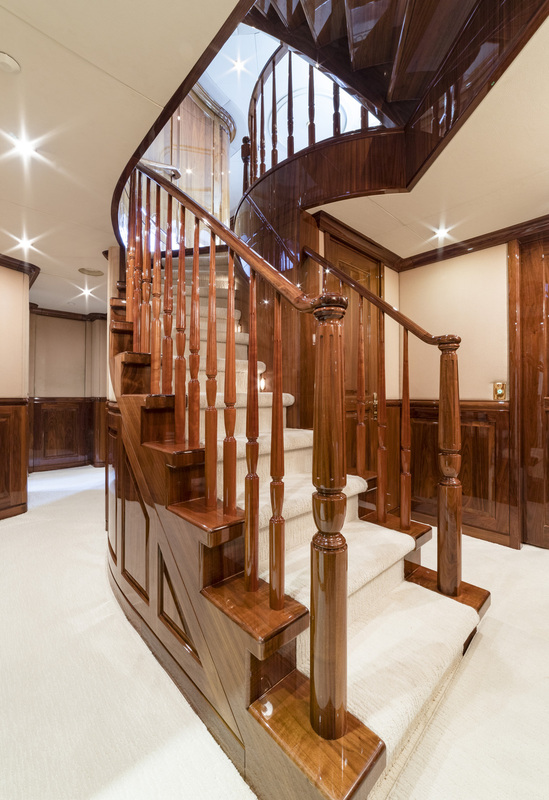 The interior dining area is also on the main deck and is furnished with a spacious cherry and walnut table with seating for 12, stained glass cabinets. 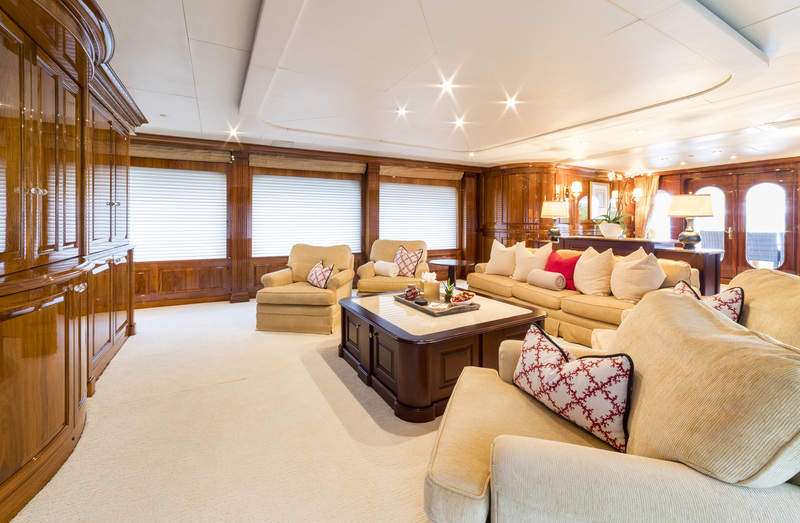 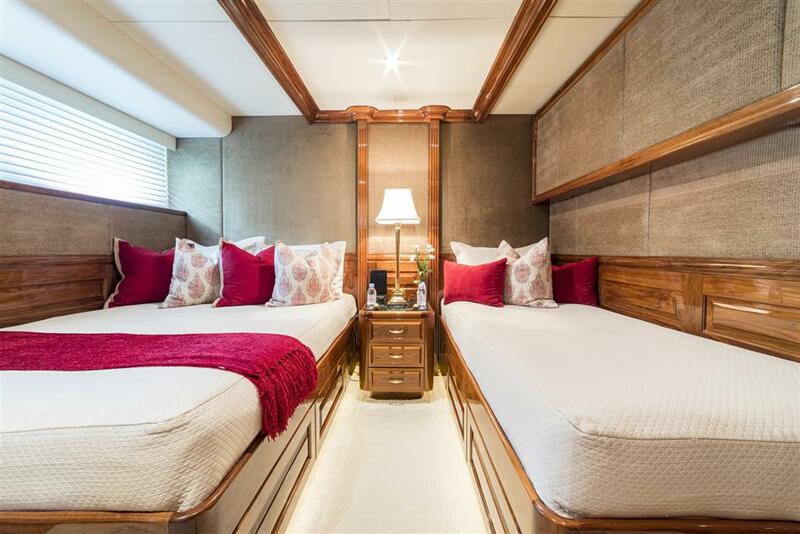 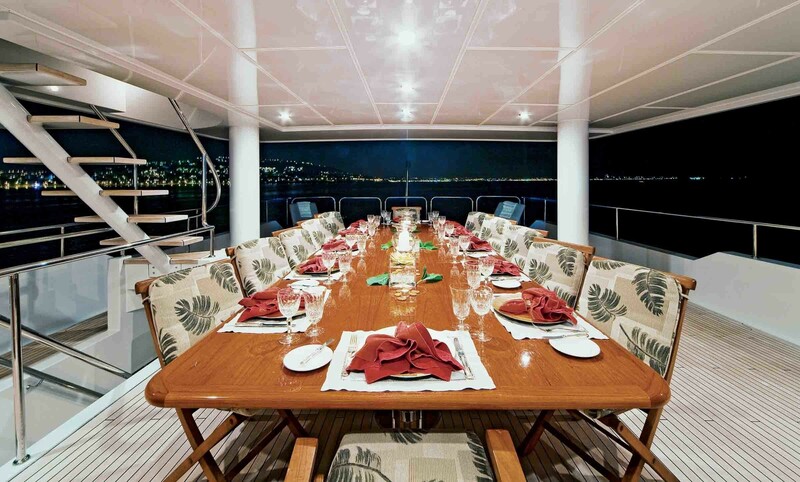 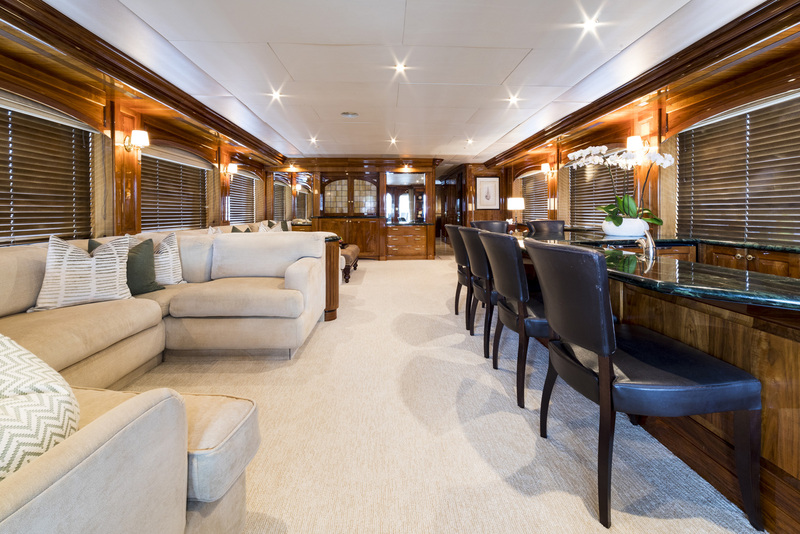 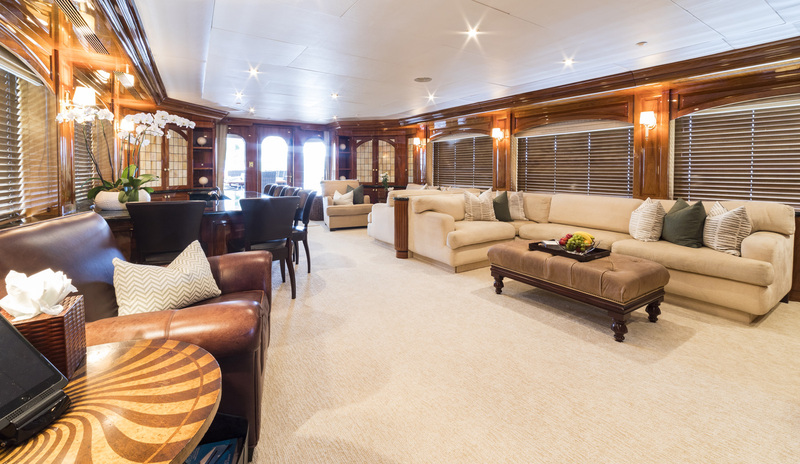 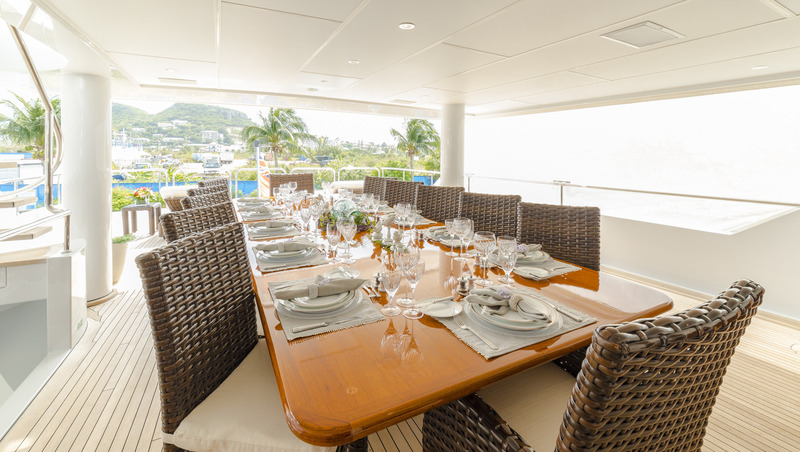 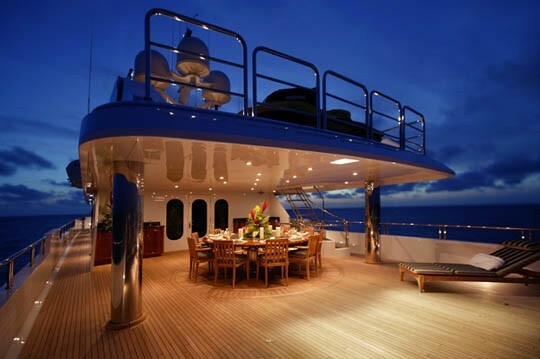 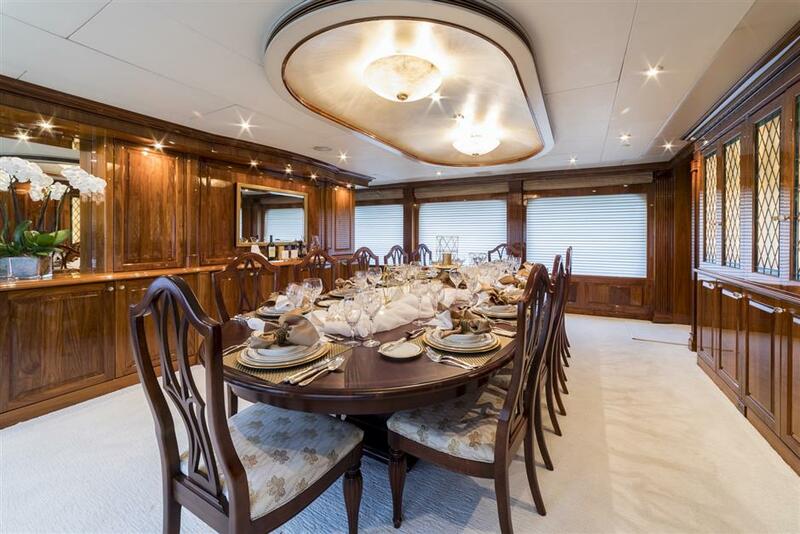 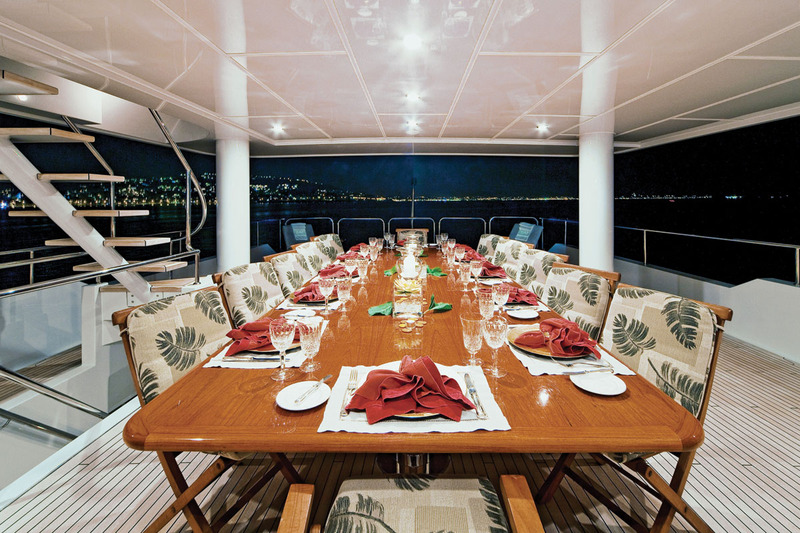 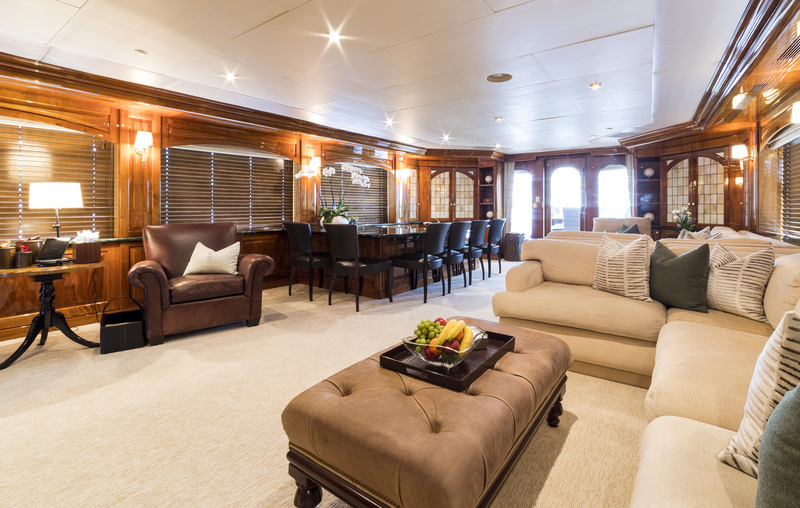 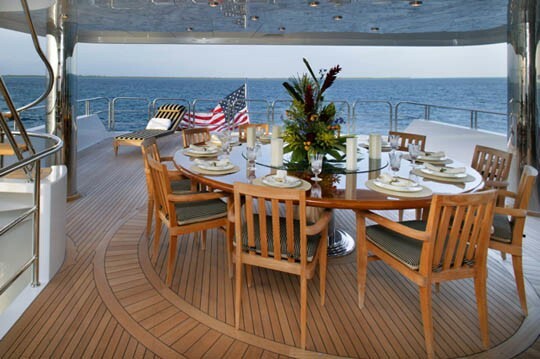 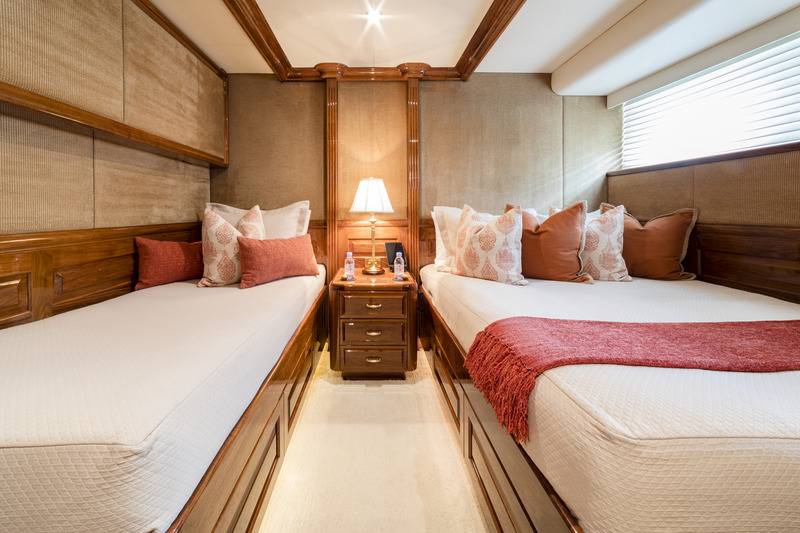 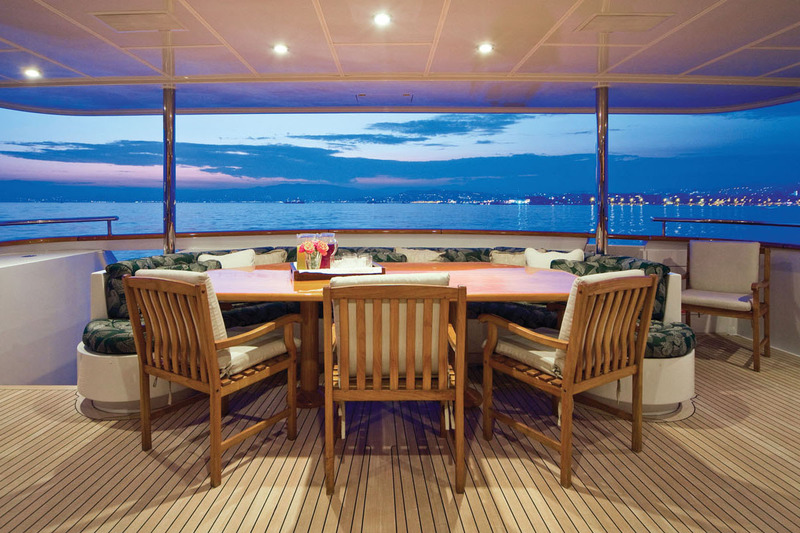 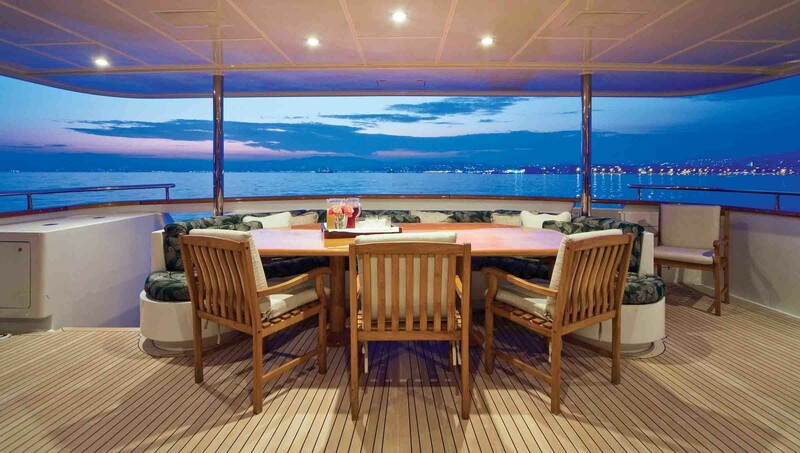 For more casual alfresco dining, there are ample opportunities, with dining for 12 on the main aft deck, and a second outside dining area for 12-14 on the bridge aft deck. 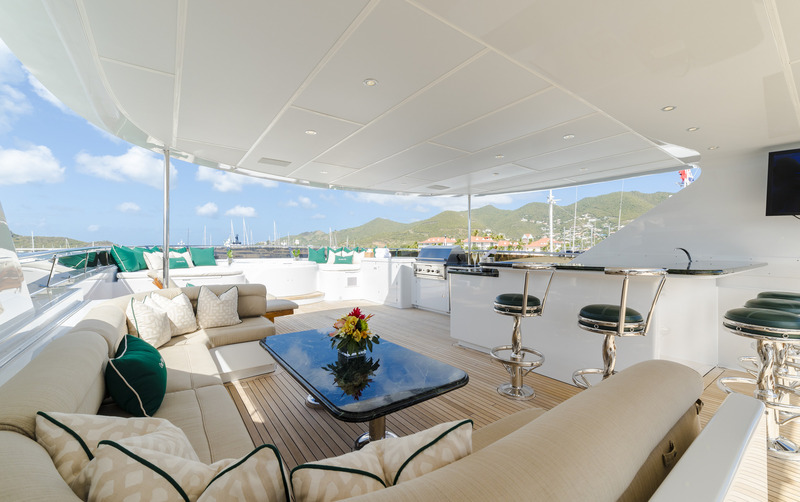 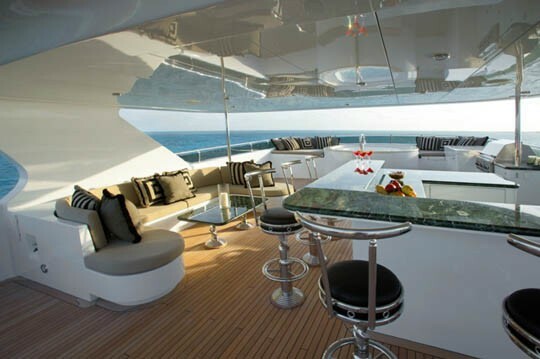 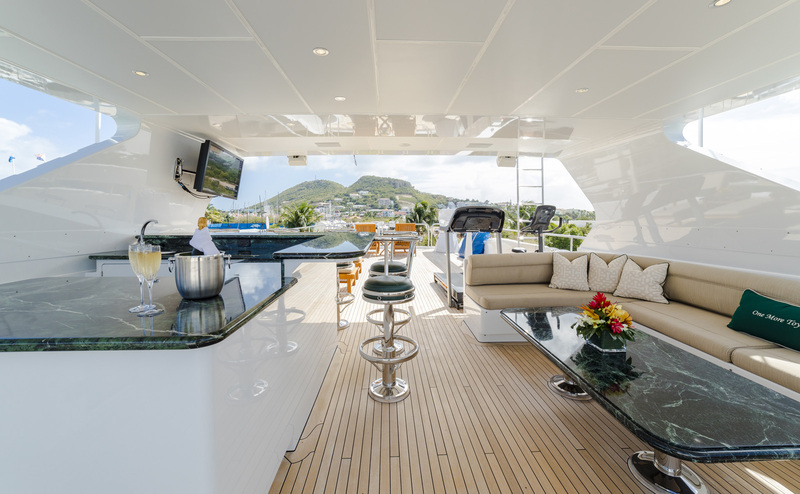 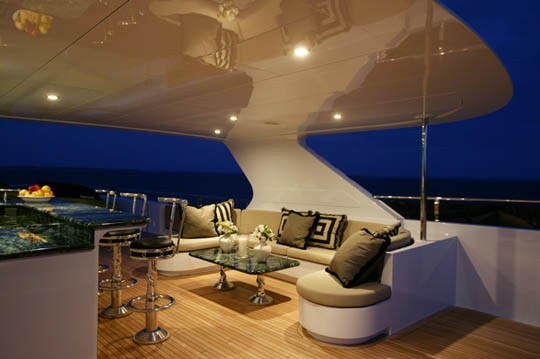 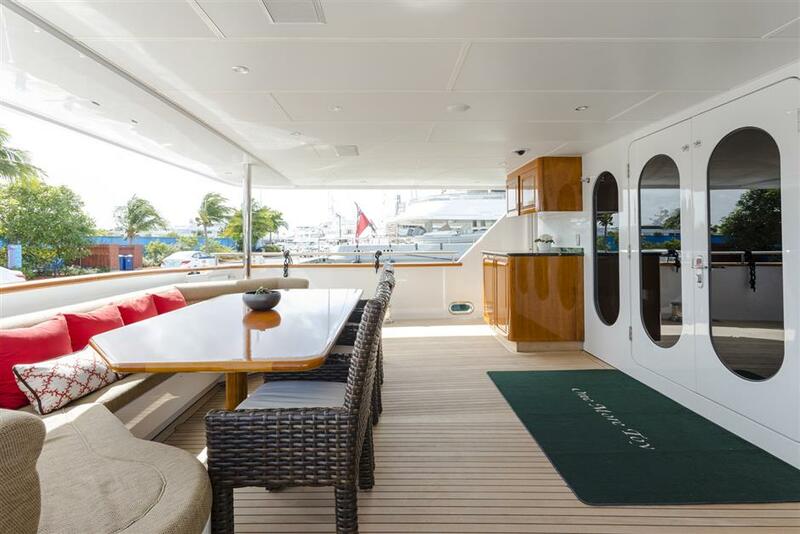 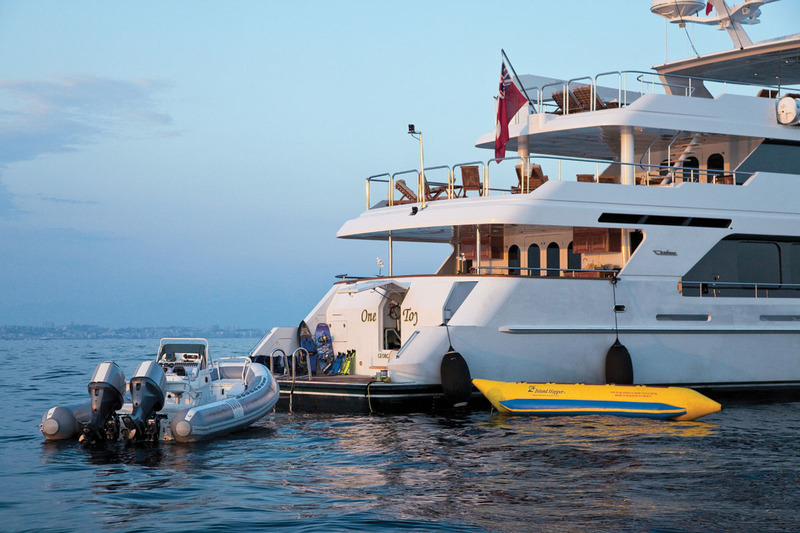 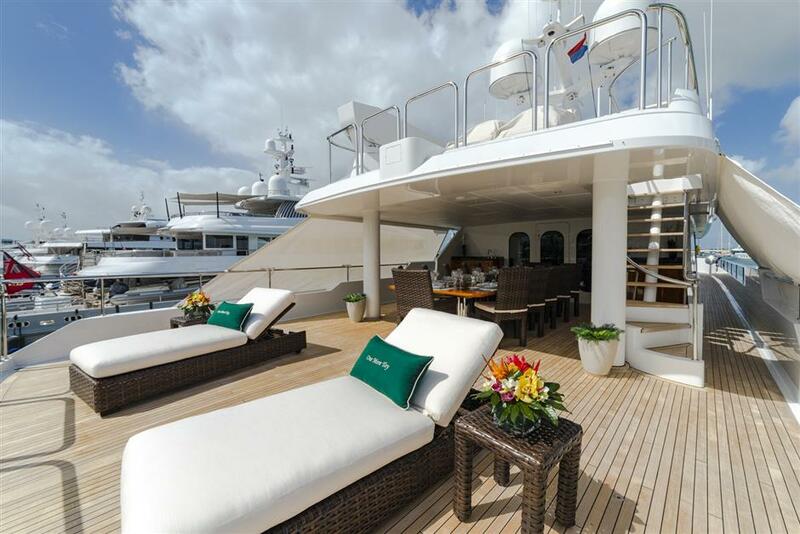 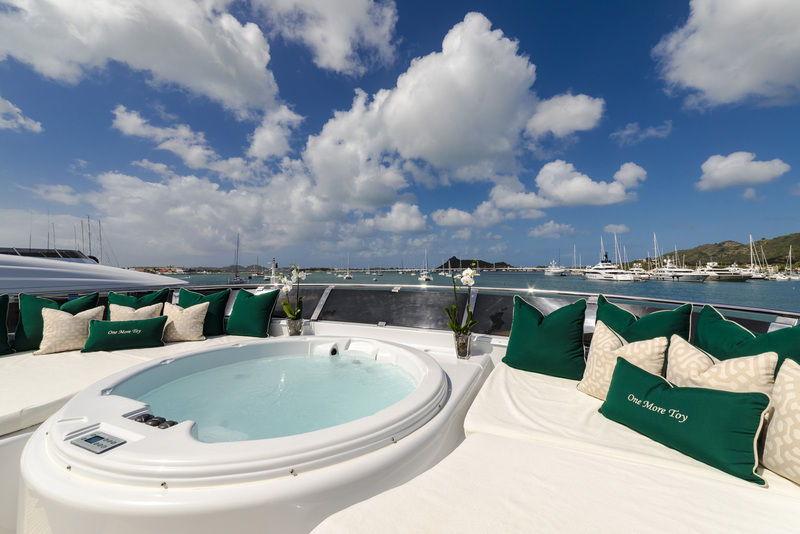 ONE MORE TOYS sundeck is fabulous for daytime use and entertainment and is equipped with a Catalina hot tub with sunpads, a gas barbecue, full wet bar with five stools and a refrigerator. 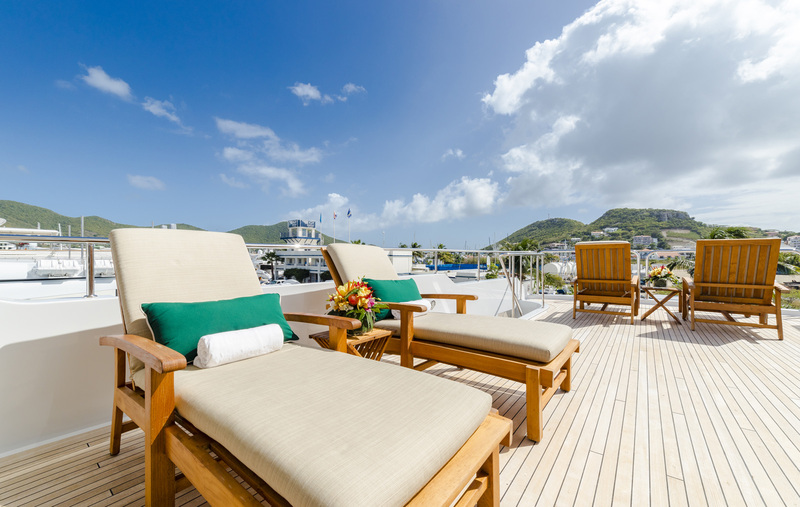 A U-shaped bench with seating for 8 provides a beautiful setting for sundeck cocktails or canapés and eight teak chaise lounges with cushions, and teak side tables provide an excellent place to relax and soak up the sun. 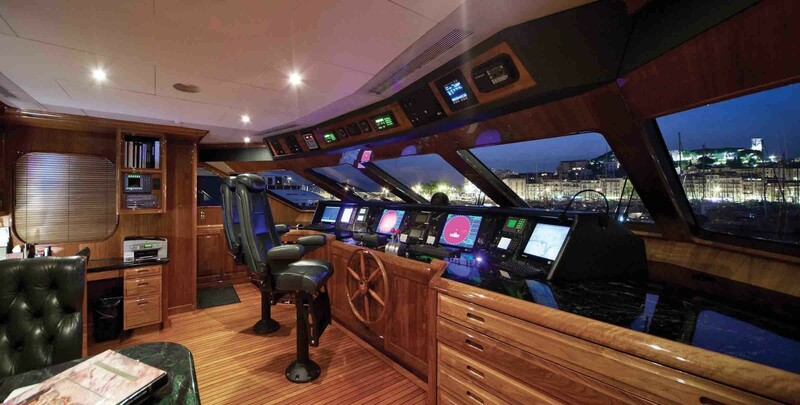 An elevator connects all decks onboard. 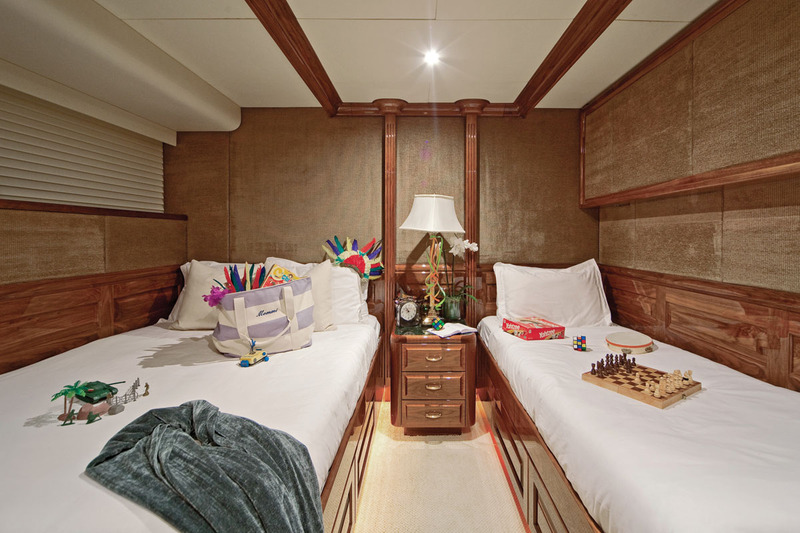 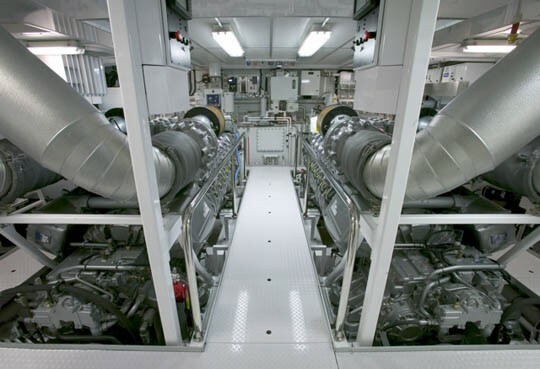 In 2013, ONE MORE TOY refurbished her engines & generators, replaced carpeting throughout the boat, and had miscellaneous interior upgrades. 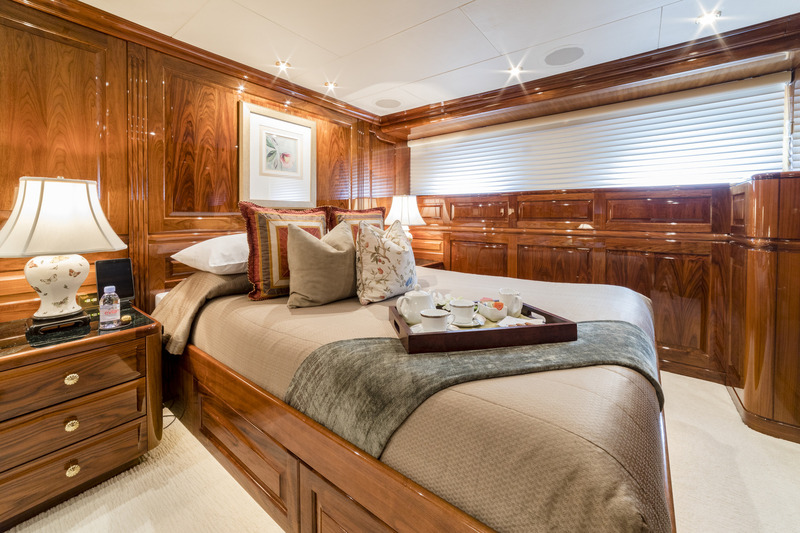 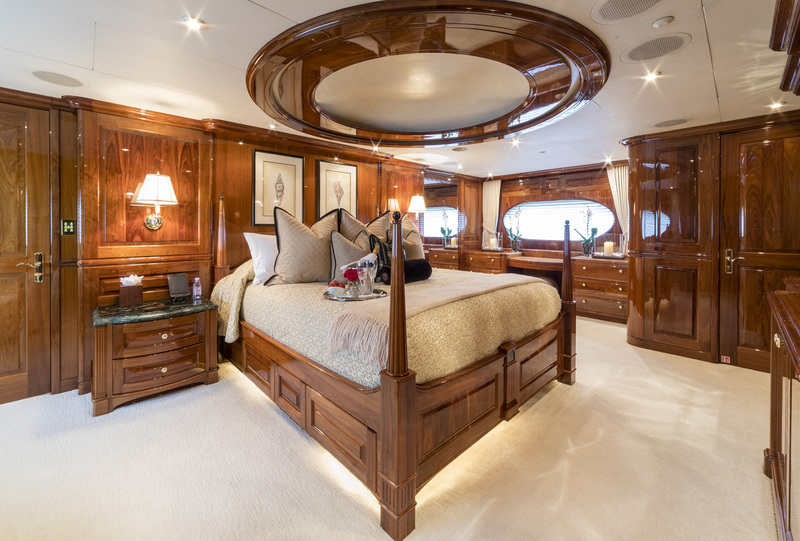 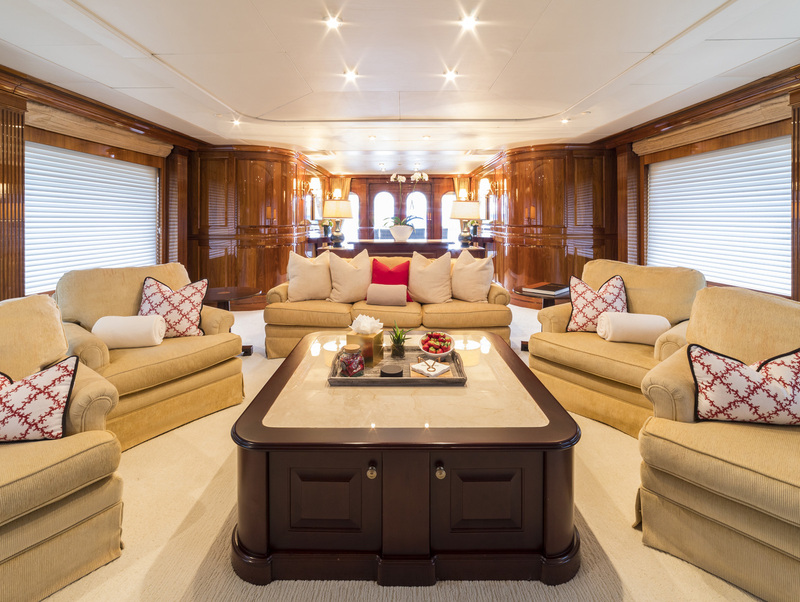 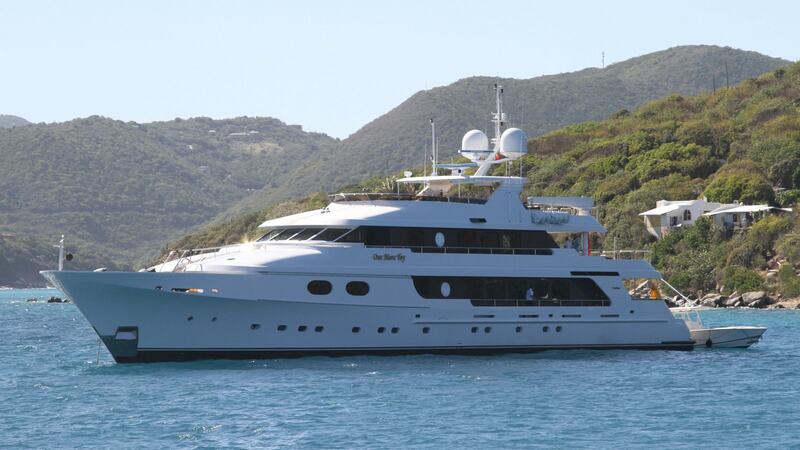 She also received new china & linens, and a new/used tender, Novurania and wave runners. 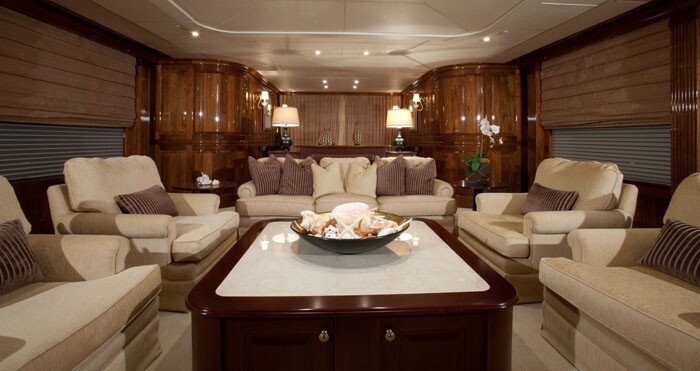 Motor Yacht One More Toy provides luxurious accommodation for 12 guests in 6 glorious staterooms: She has an on deck master stateroom with a romantic King sized poster bed, side lounges and small table, a large vanity until, a private office and full entertainment including a 42" plasma TV, DVD & CD & VCR. 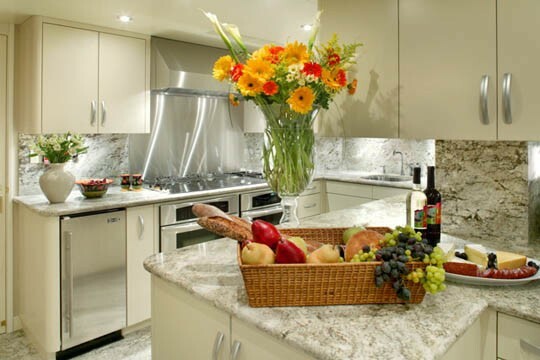 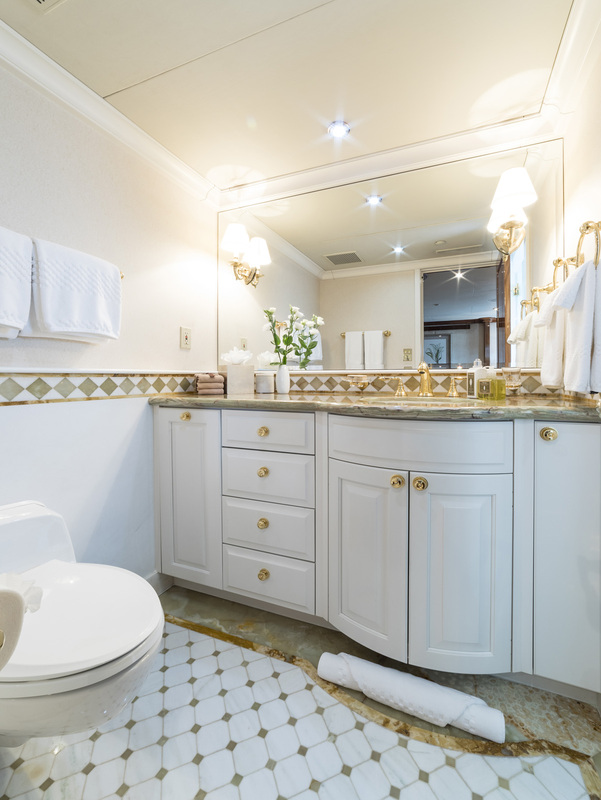 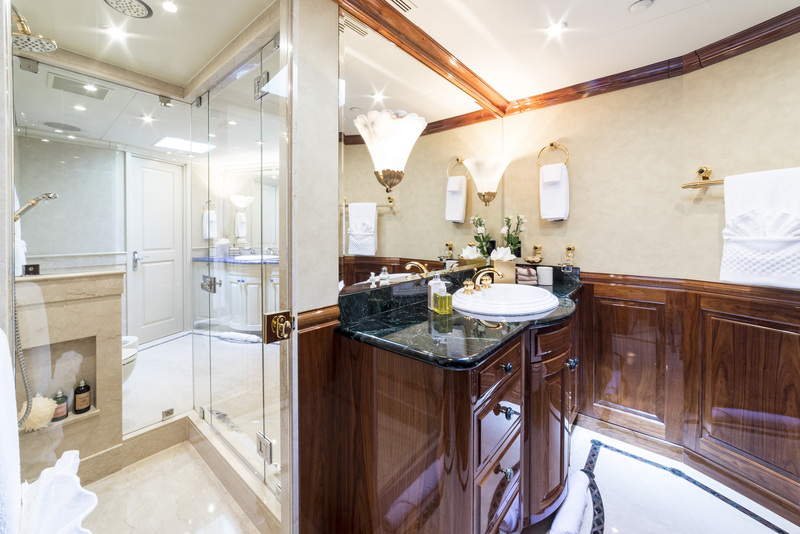 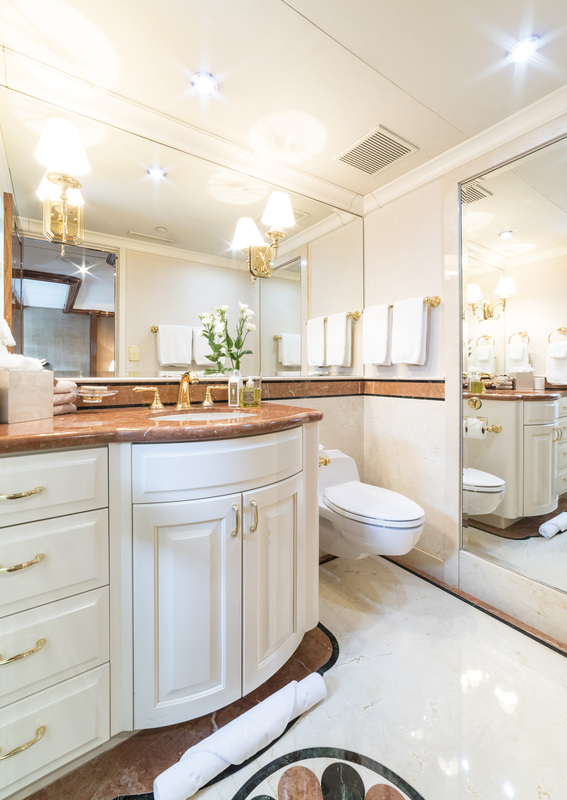 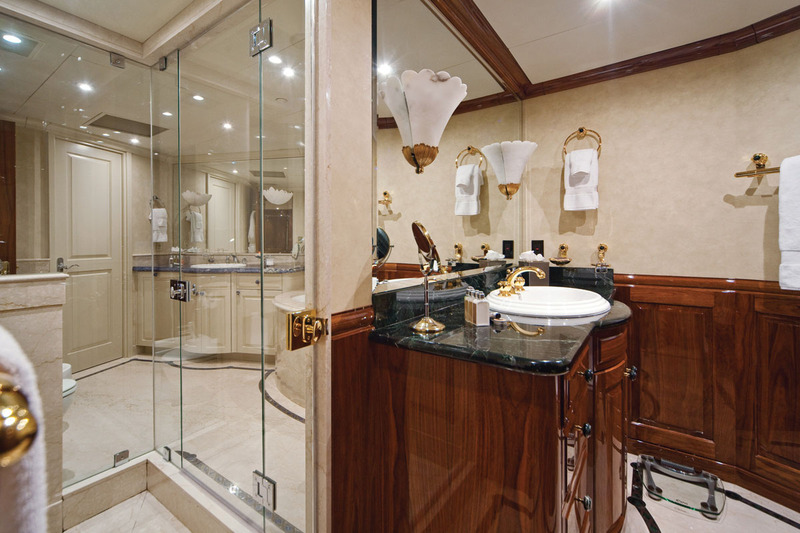 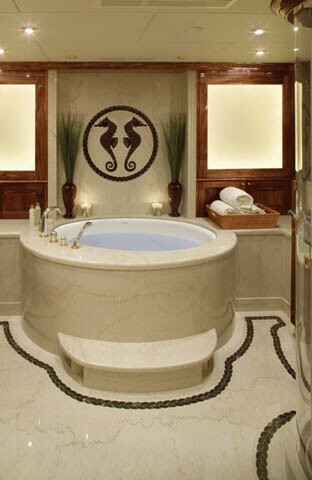 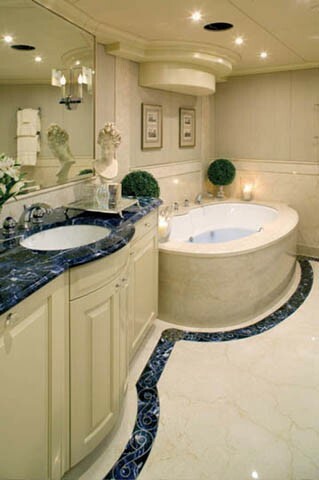 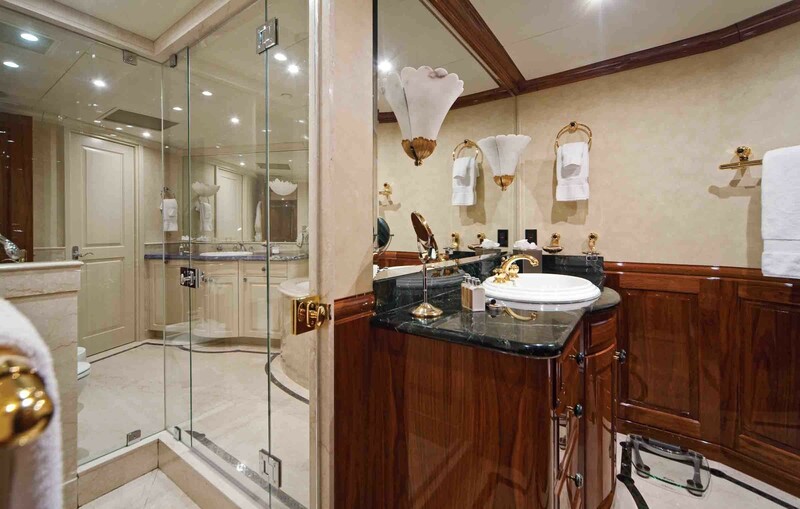 The private ensuite bathroom has elegant marble flooring and his and hers facilities. 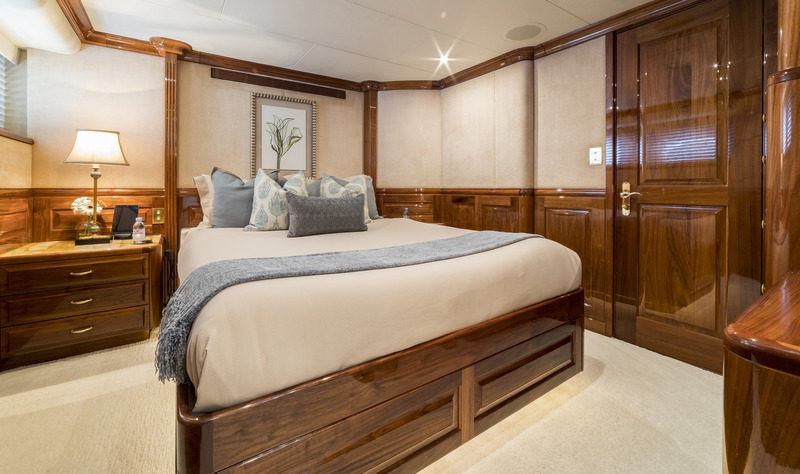 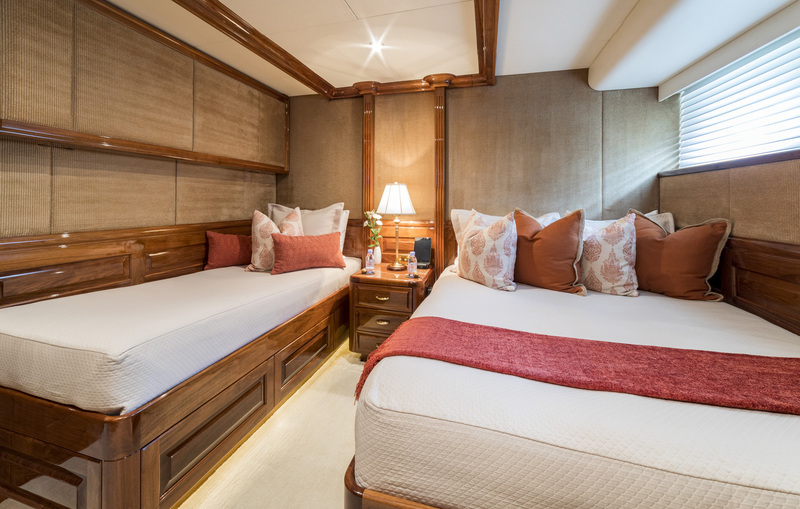 The VIP stateroom has a Queen sized bed, the same entertainment facilities, expansive wardrobes, a small private lounge area, and an ensuite bathroom with Spa Pool tub. 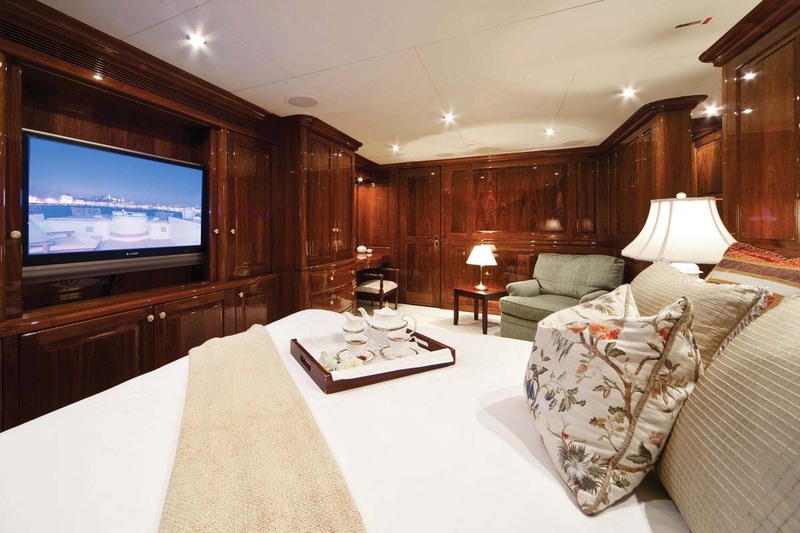 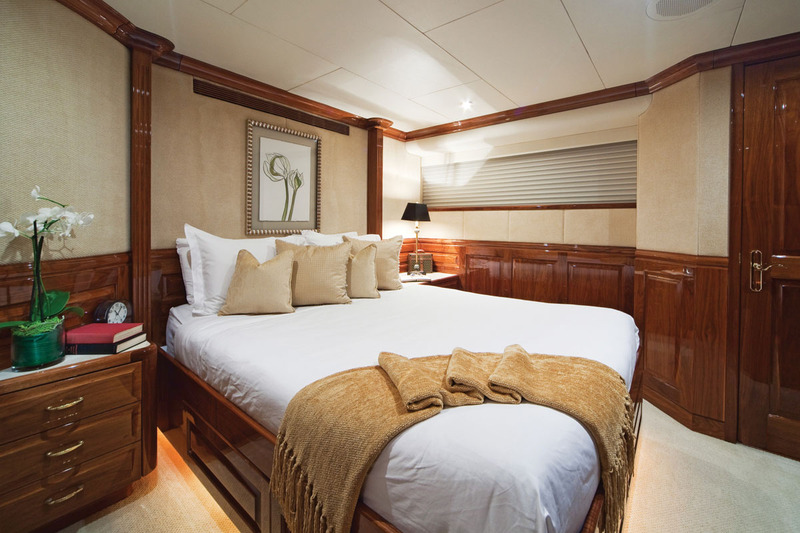 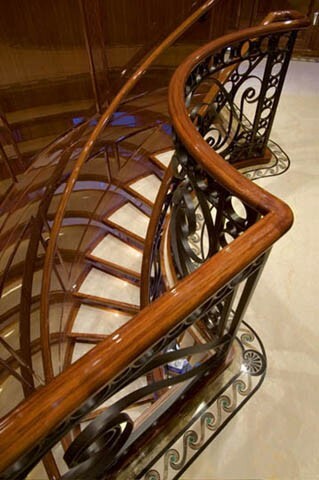 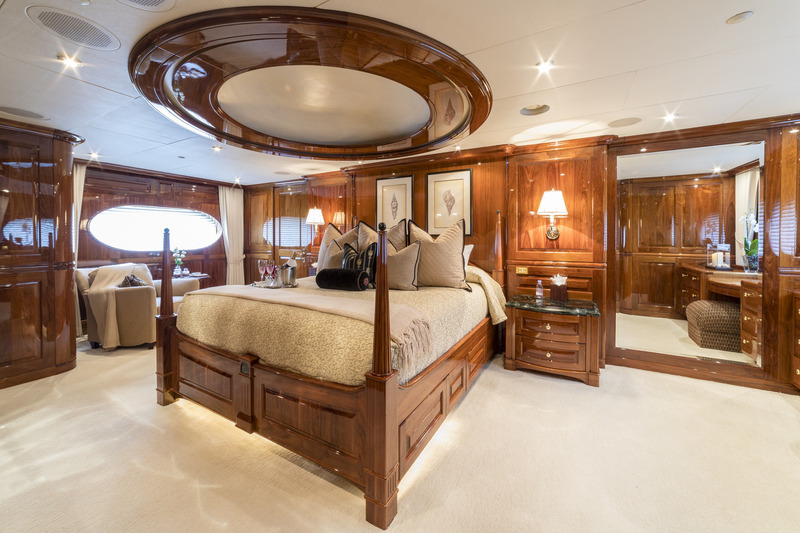 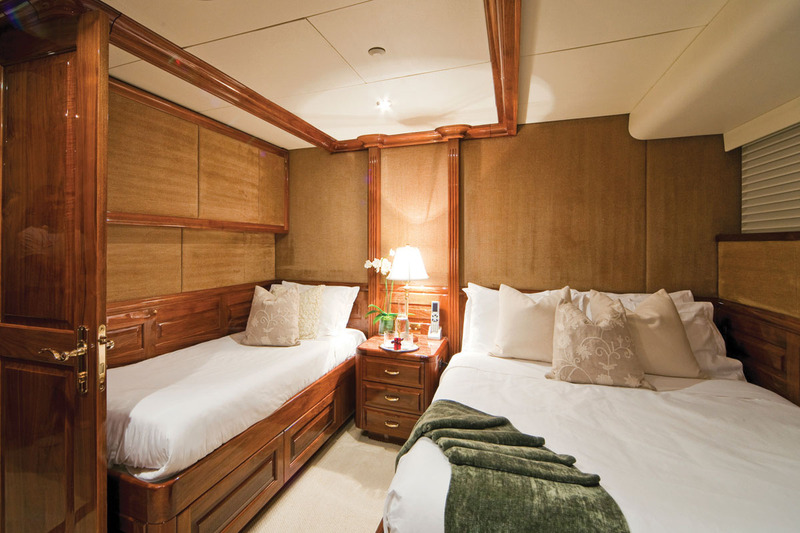 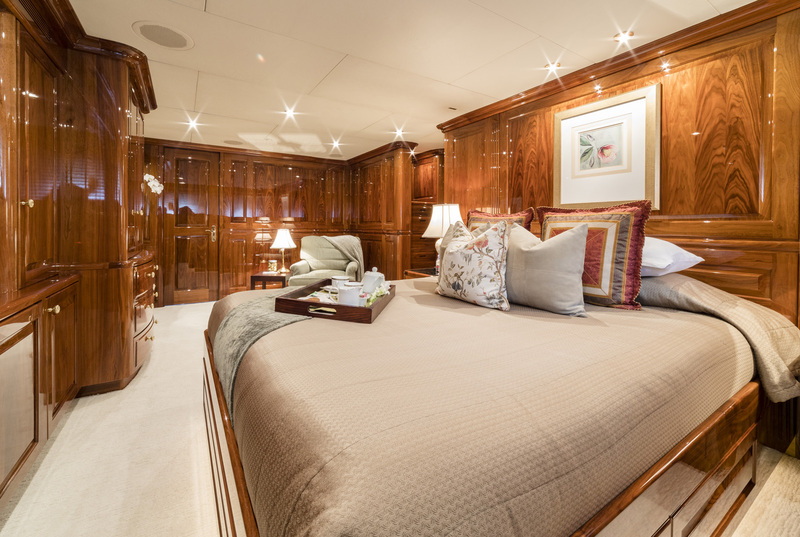 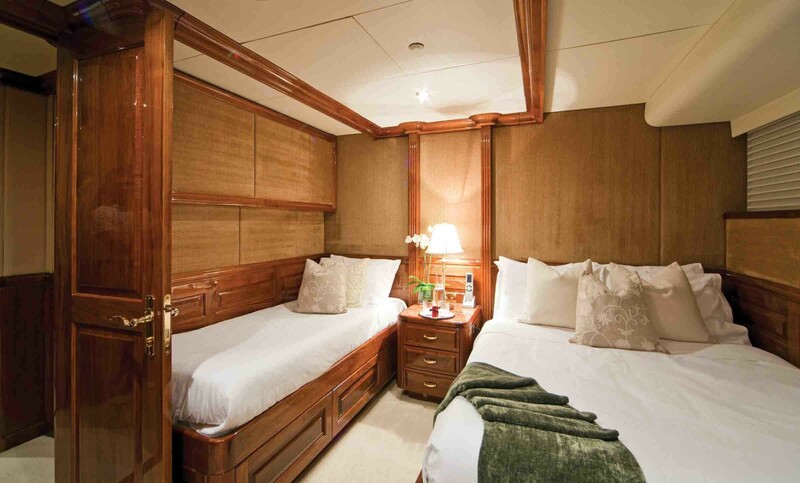 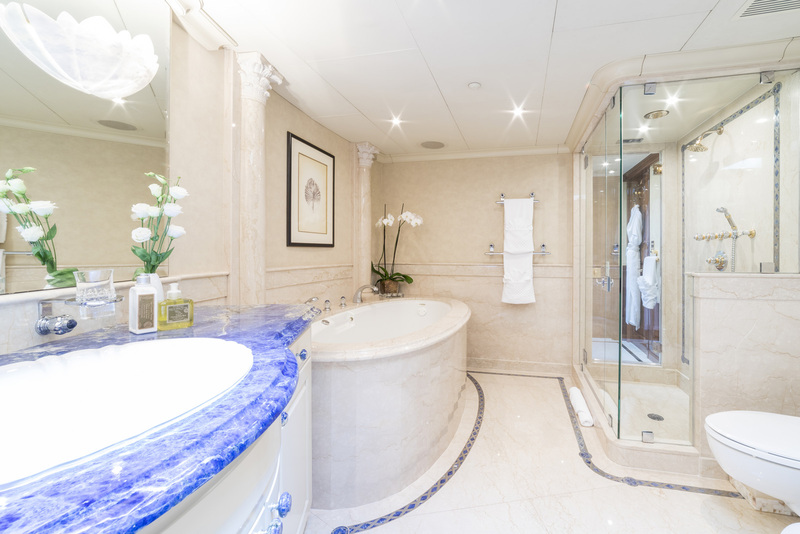 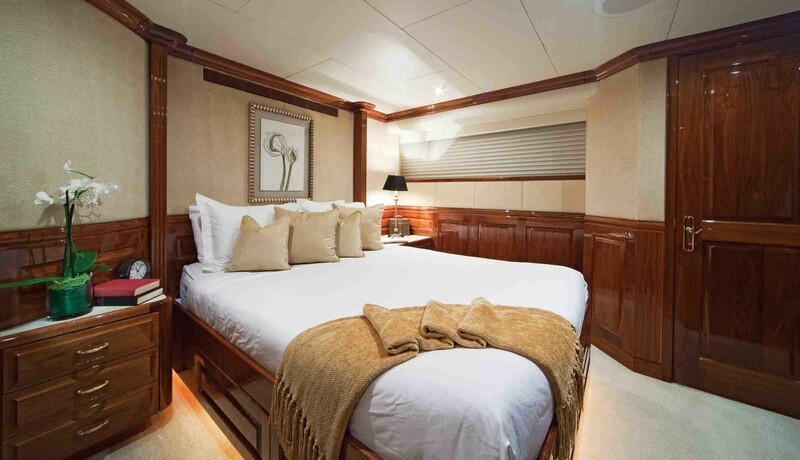 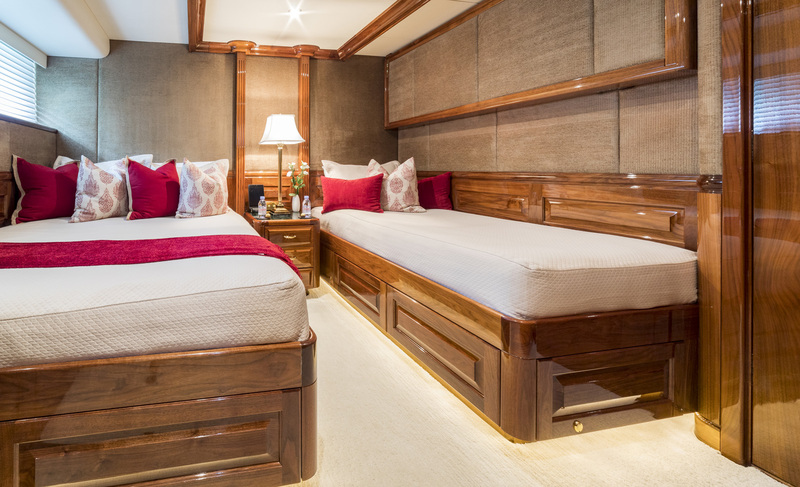 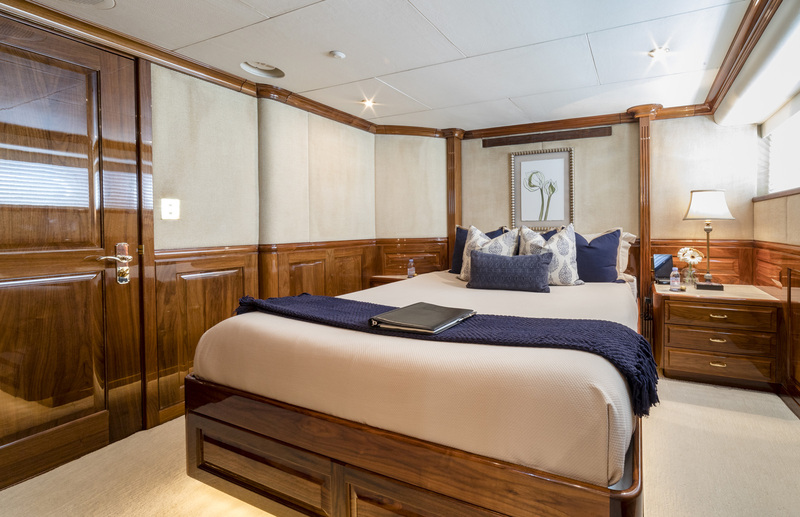 There are four further guest staterooms comprising of two queens and two doubles, each with their own private ensuite. 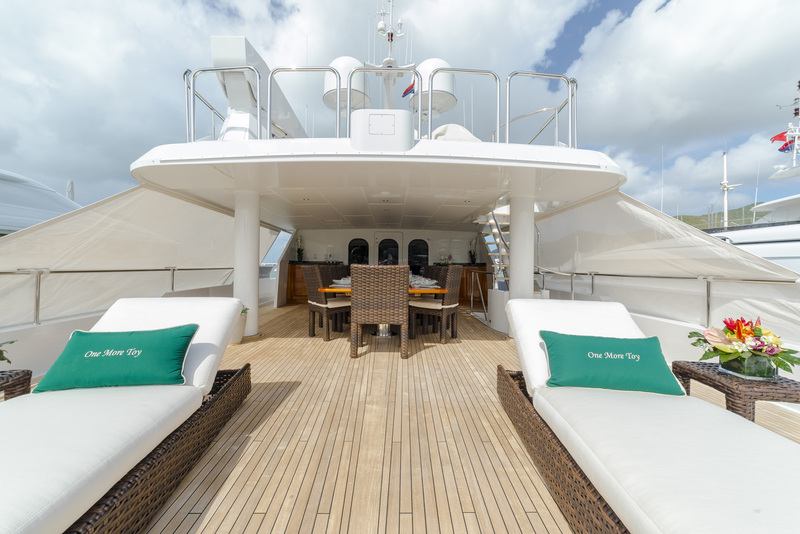 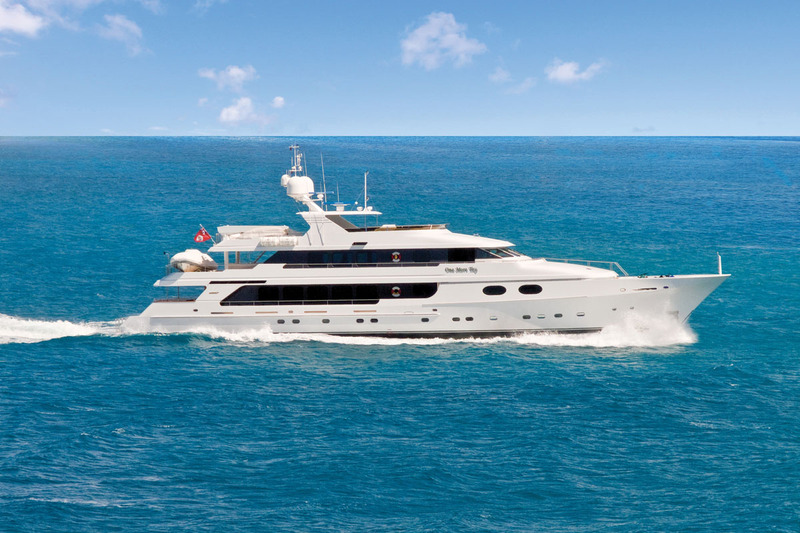 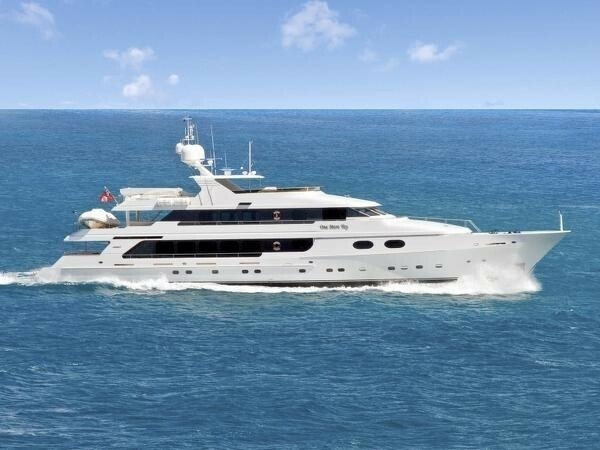 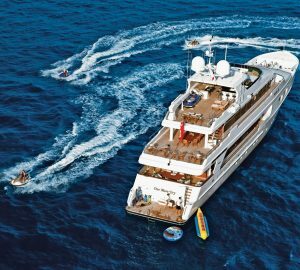 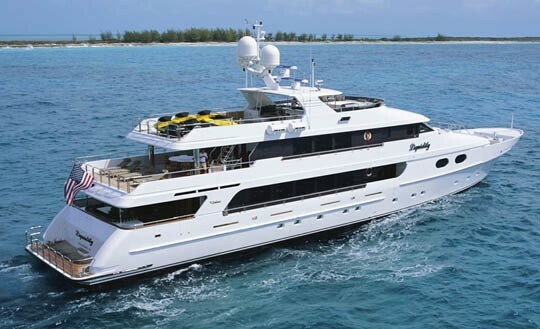 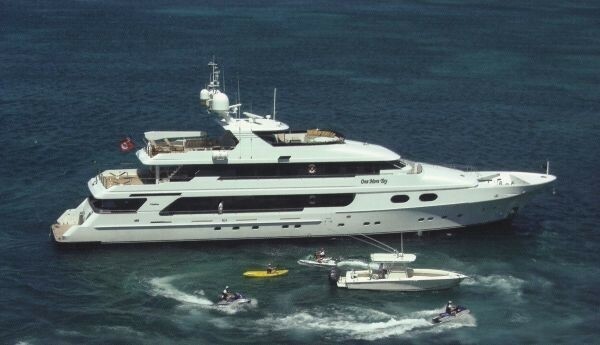 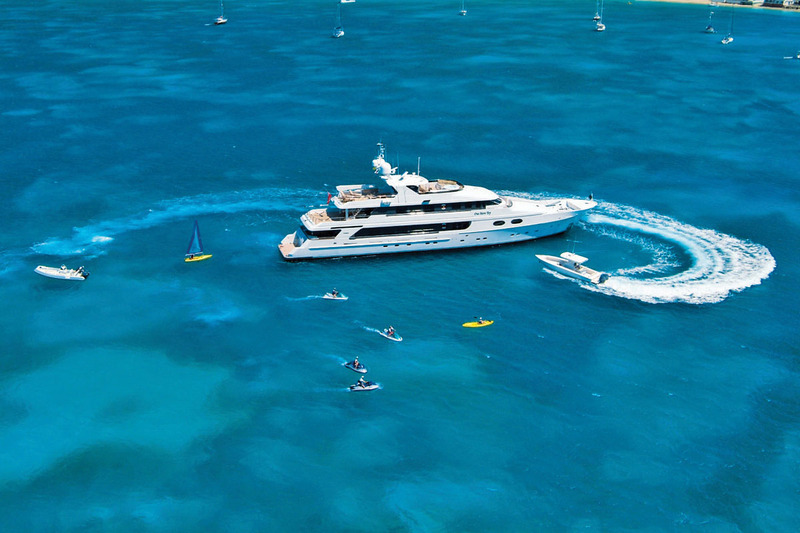 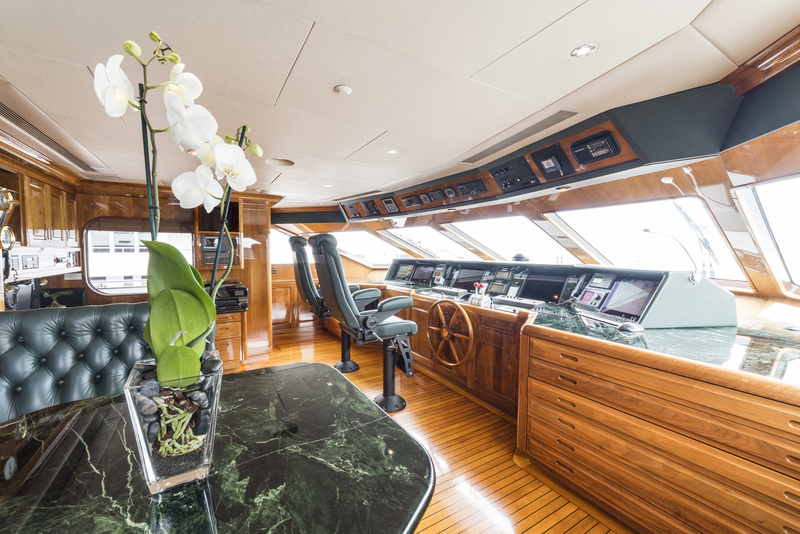 Luxury Motor Yacht ONE MORE TOY is equipped with a range of fun toys for young and old including an impressive 31ft Jupiter Sports Fishing Boat with 225hp engines and a huge range of fishing gear including most conceivable rods and reels. 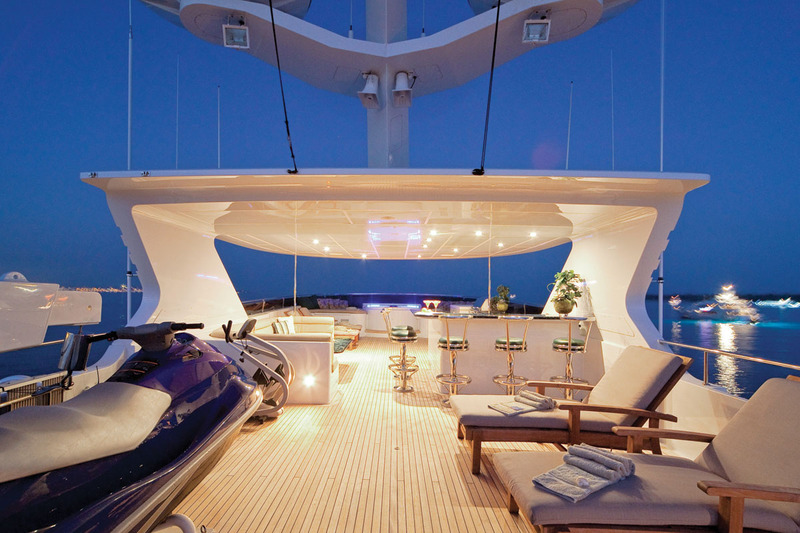 Please contact us for a full list. 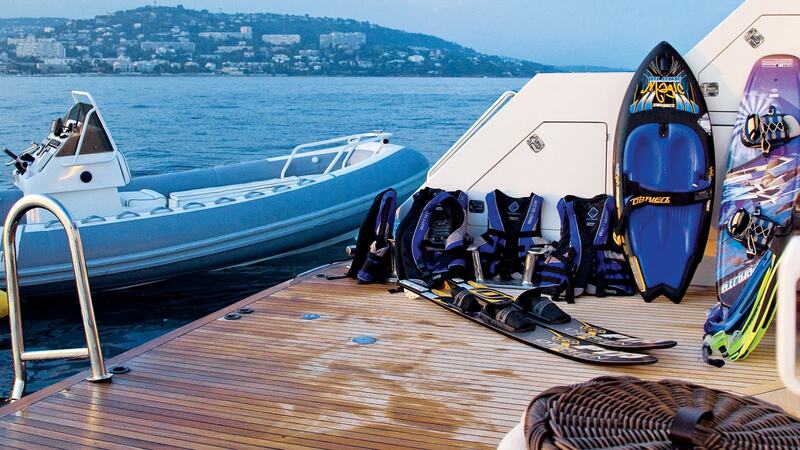 Further toys including a 21ft Novurania inflatable tender with 2 x 130hp engines, towable inflatable toys, two kayaks, Wave runners, beach games and snorkelling gear plus a range of free weights for muscle conditioning. 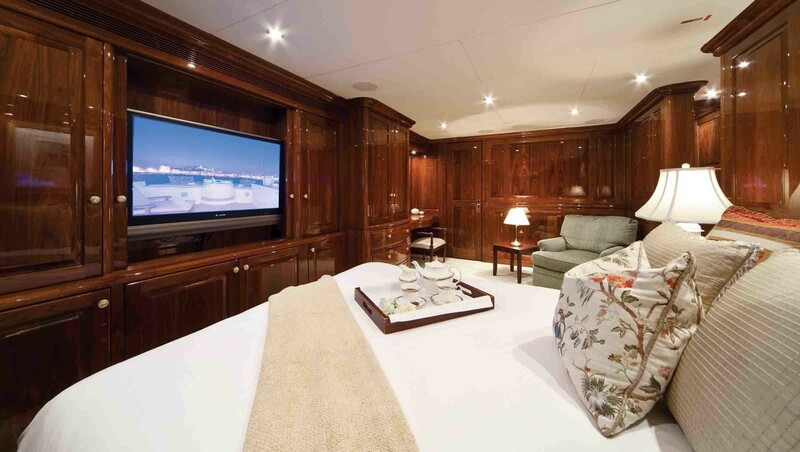 Audio visual facilities onboard are extensive with a large system of full entertainment in the salon and a flat screen Satellite TV, DVD, VCR and CD in each cabin. 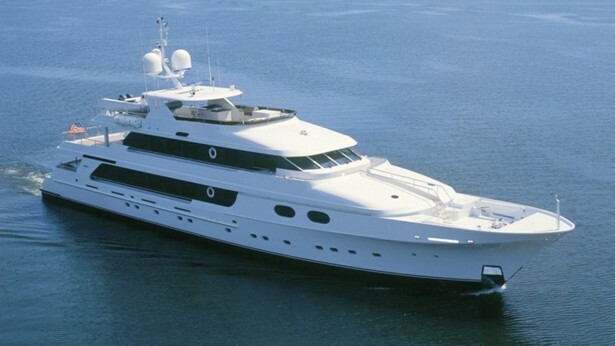 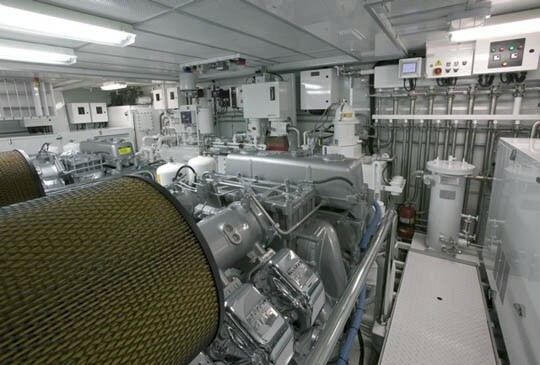 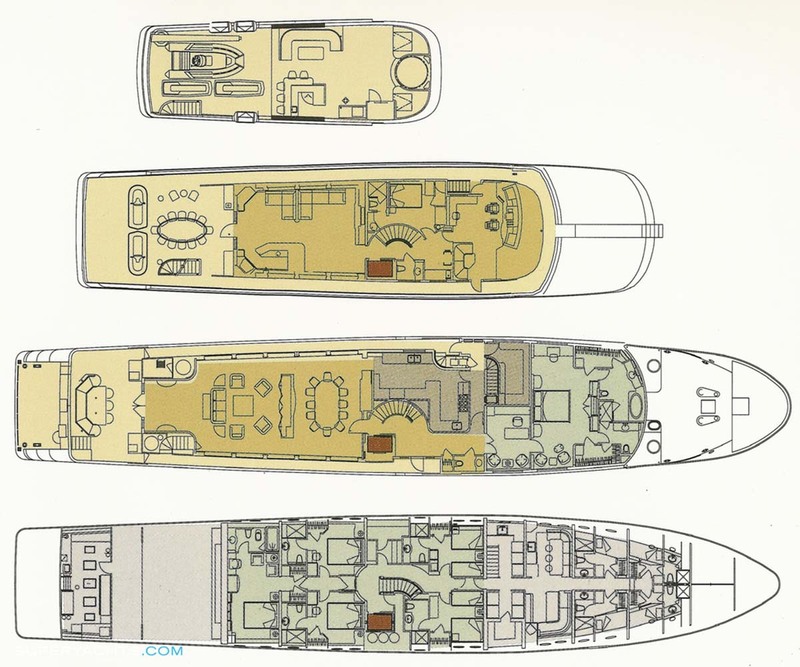 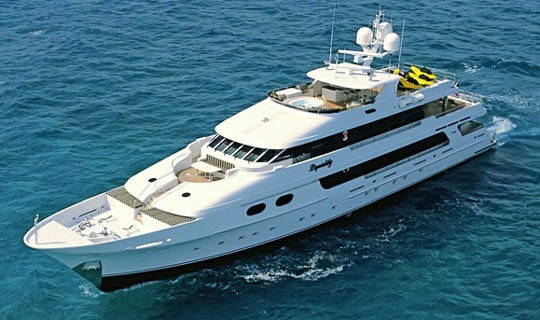 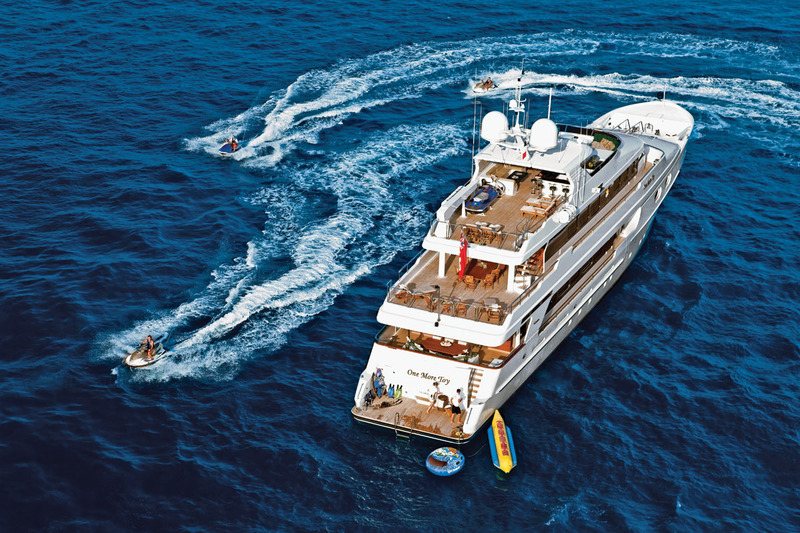 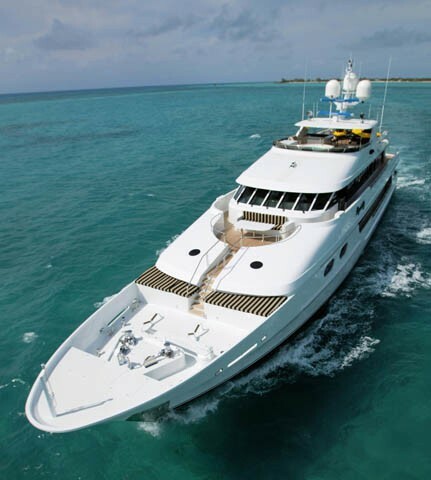 Communication capabilities onboard including Satellite Communications, Cell Phones and WiFi internet throughout.